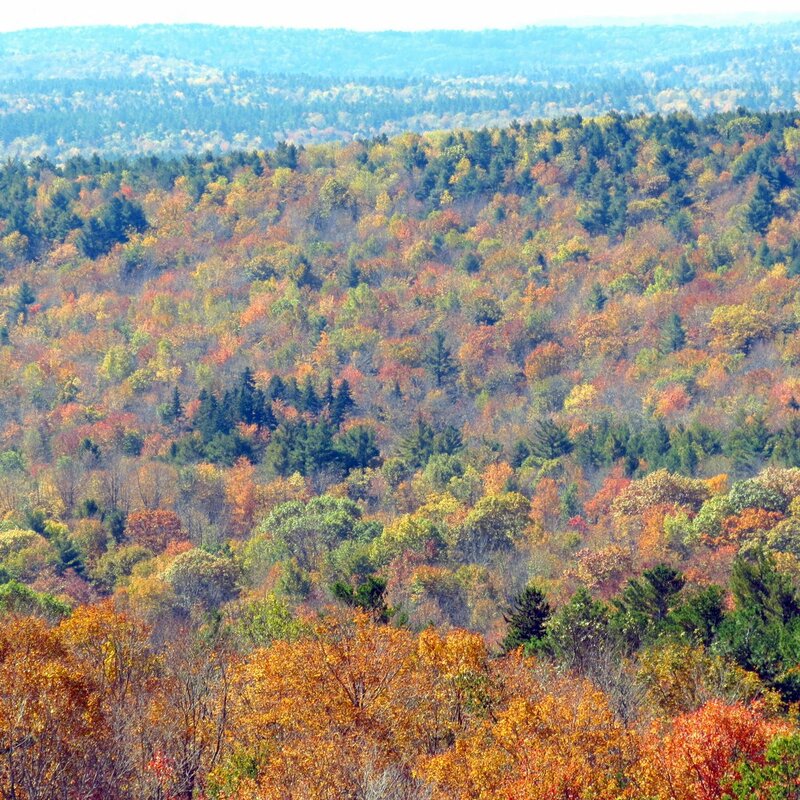 The rapidly dropping leaves told me if I was going to climb to see the foliage colors from above I’d better get a move on, so on the 14th I drove over to Pitcher Mountain in Stoddard where there is a 360 degree view from the summit. I’ve been having some breathing problems lately and I really didn’t know if I could make it to the summit or not, but I threw caution to the wind and with a good puff on the old inhaler, up I went. Sorry about the lens flare but it was a beautiful sunny day. There were plenty of opportunities to stop and catch my breath and that was a good thing because if I went by the amount of people coming down as I was going up, it must have been standing room only up there. I’d bet I passed at least twenty people. 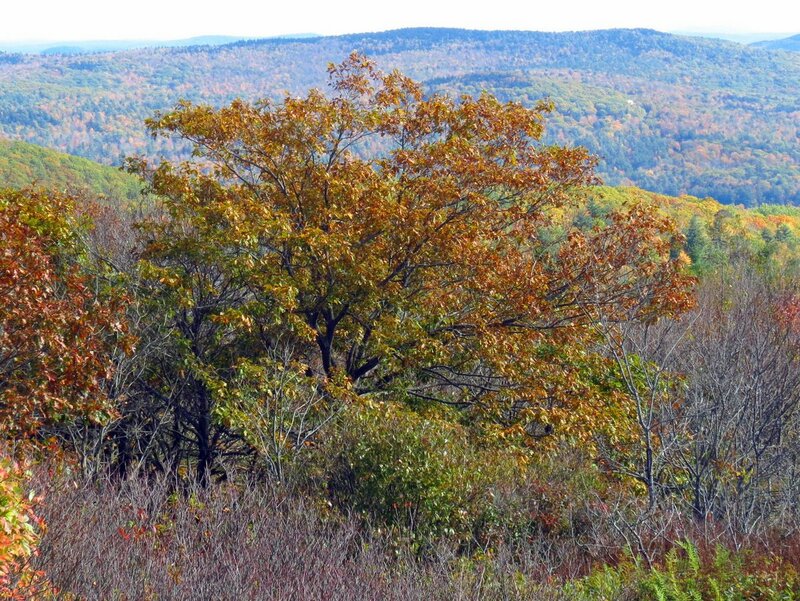 This photo is of an oak that was already changing into its fall colors. 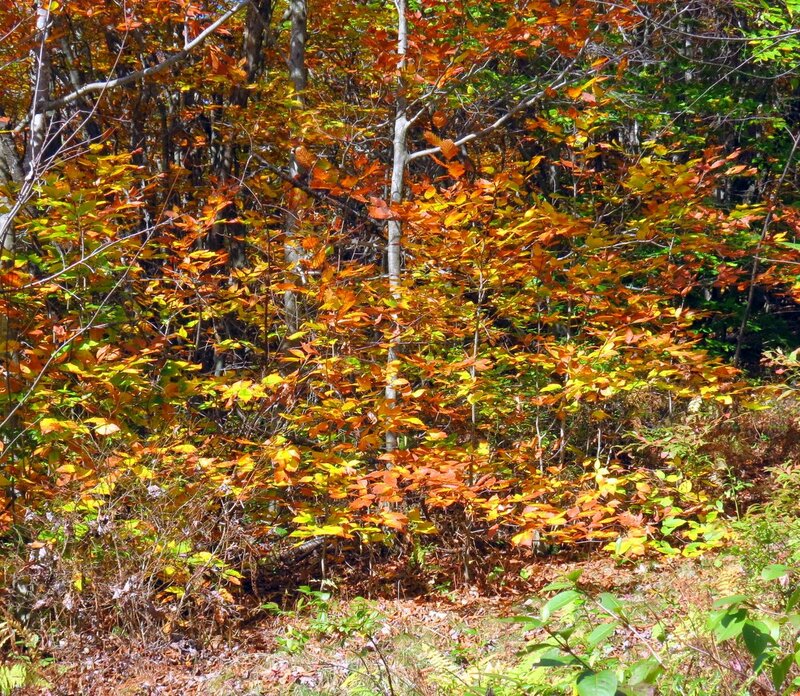 Beeches are also changing and they along with the changing oaks tell me I had better get over to Willard Pond soon. 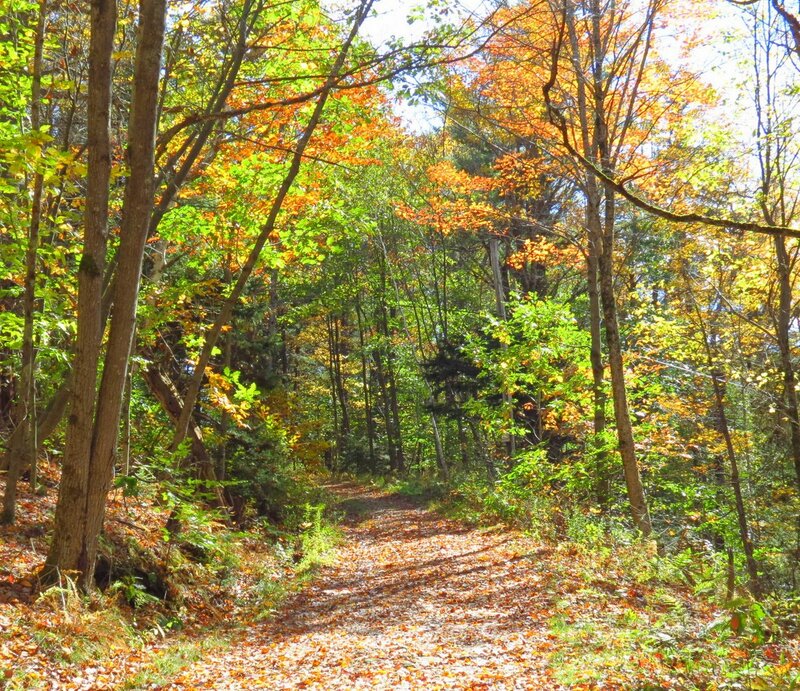 Willard Pond is especially beautiful at this time of year with its hillsides of yellow beeches and orange, red and purple oaks. 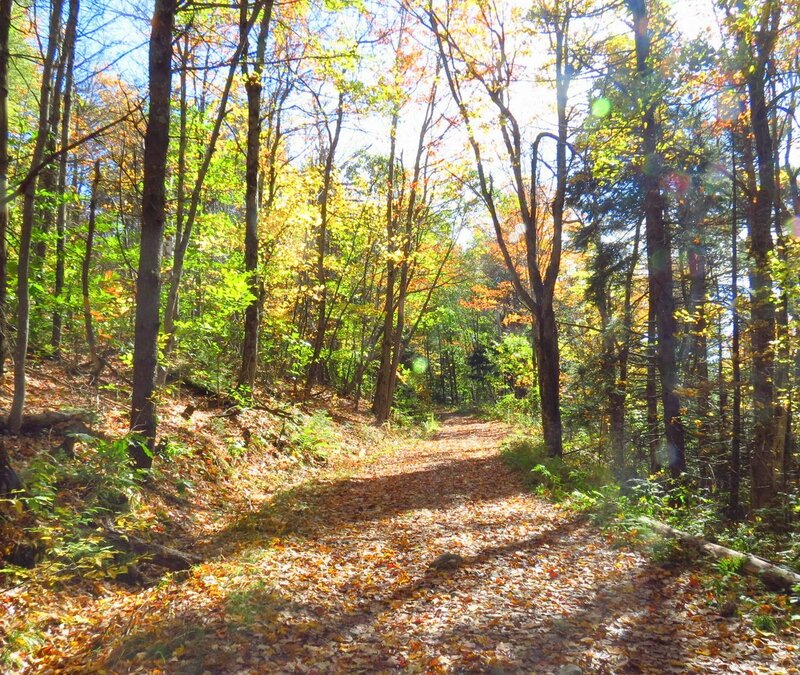 The trail up Pitcher Mountain is short but steep in places and when you feel like you are carrying a weight on your chest it seems even steeper. 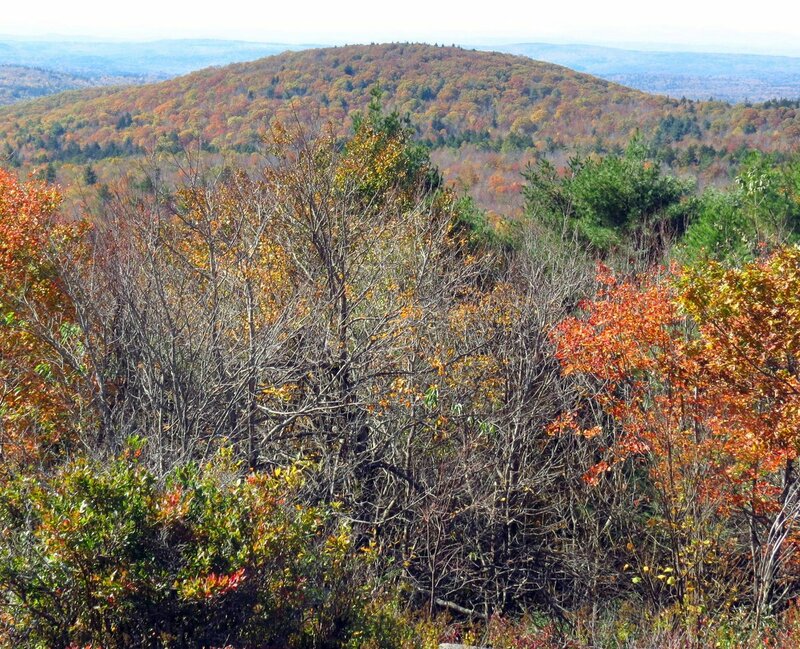 Pitcher Mountain is named for the Pitcher family who settled here in the mid-1700s. 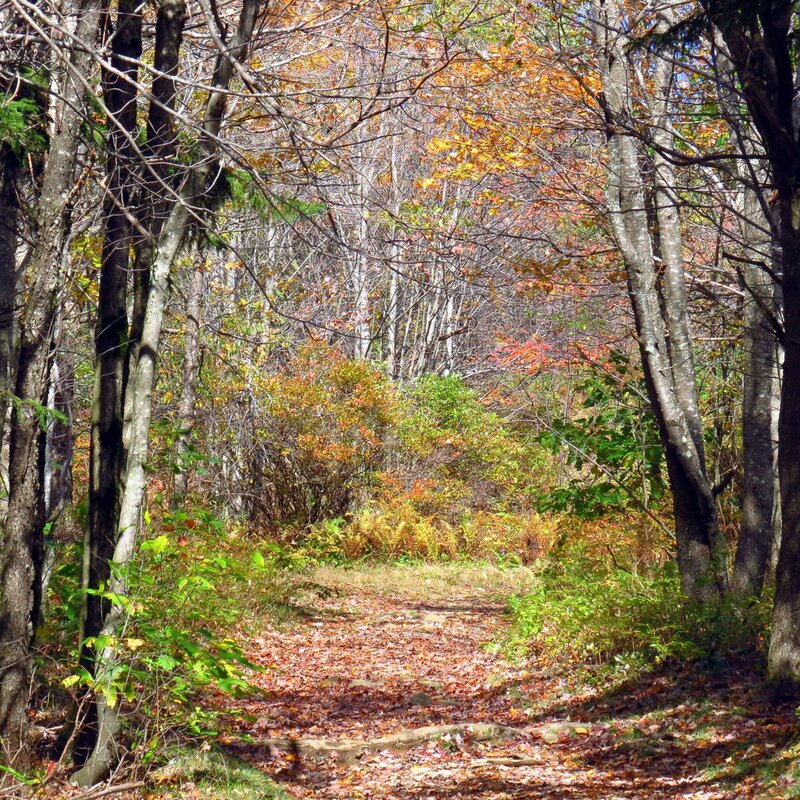 There are still remnants of an apple orchard near the summit, with trees that still bear apples. I doubt they’re from the 1700s but they are quite old. This is always a stopping place, breathing problems or not. 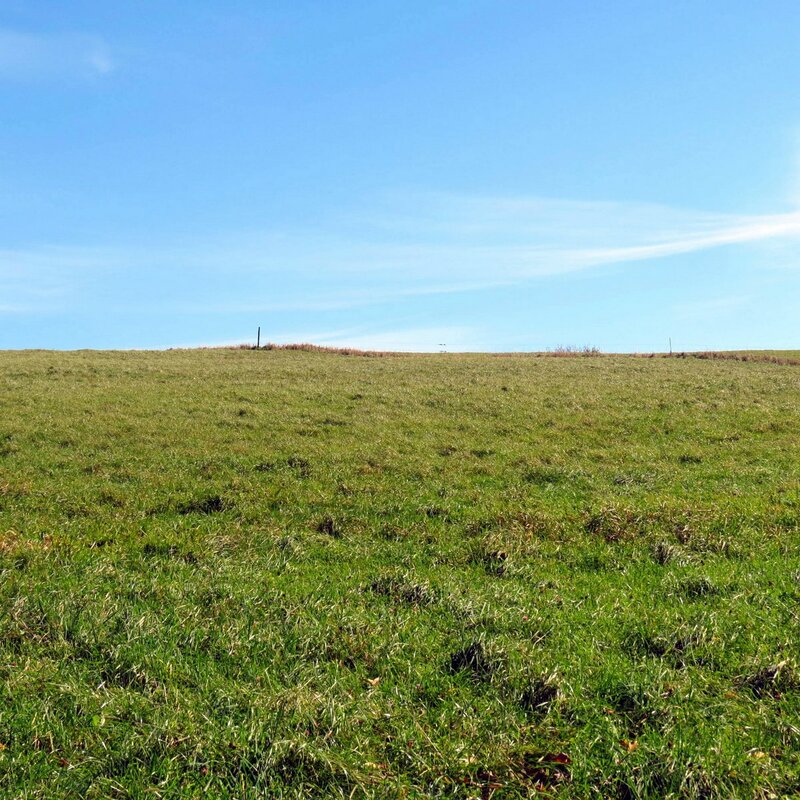 I always feel a great sense of release when I see this view and can imagine I hear a great whooshing sound, as if everything has suddenly been stripped away. There is the earth, the sky, and nothing else but emptiness, and when you’ve lived 60+ years surrounded on all sides by thick forest that emptiness can be very welcoming indeed. I sat on a stone and basked in it and forgot myself for a while. When I got moving again a blueberry bush on the side of the trail had been caught in a sunbeam, and it was beautiful enough to stop me in my tracks. While I was admiring the blueberry bush I looked up and saw what I think was a rosy saucer lichen (Ochrolechia trochophora) on a tree. It was full of beautiful rosy brown apothecia and was producing spores to beat the band. If I hadn’t stopped to admire the blueberry I wouldn’t have seen it. At the base of the tree with the rosy saucer lichen was a log with a peach colored turkey tail fungus (Trametes versicolor) growing on it, so of course I had to get a photo of it. I don’t see many of them this color. 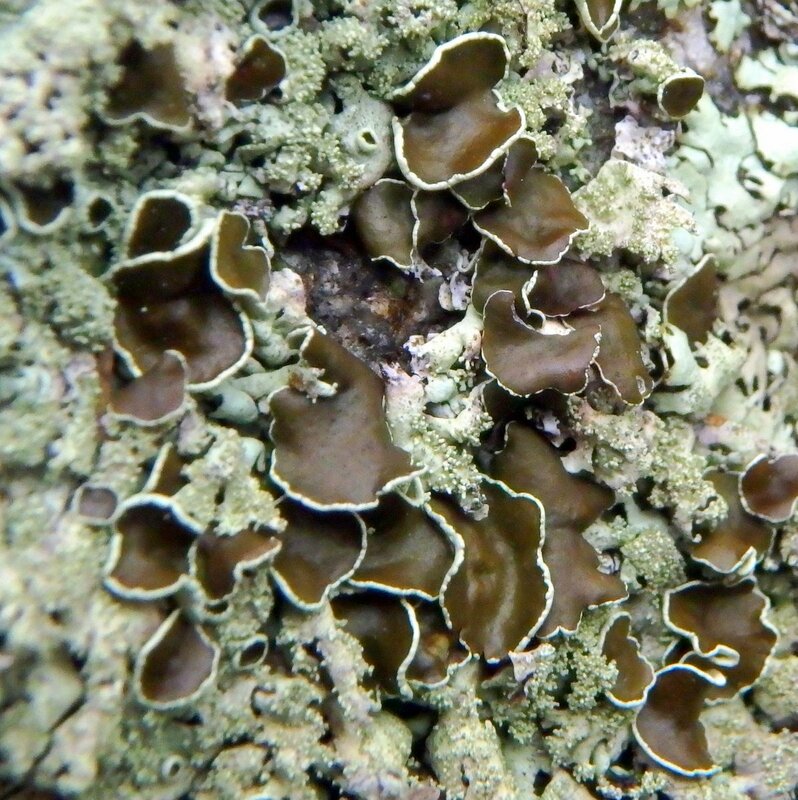 One thing leads to another in nature; the blueberry showed me the lichen and the lichen showed me the turkey tails. I wander like this from interesting thing to interesting thing quite regularly. It’s as easy as looking around closely before you leave any given bit of nature. 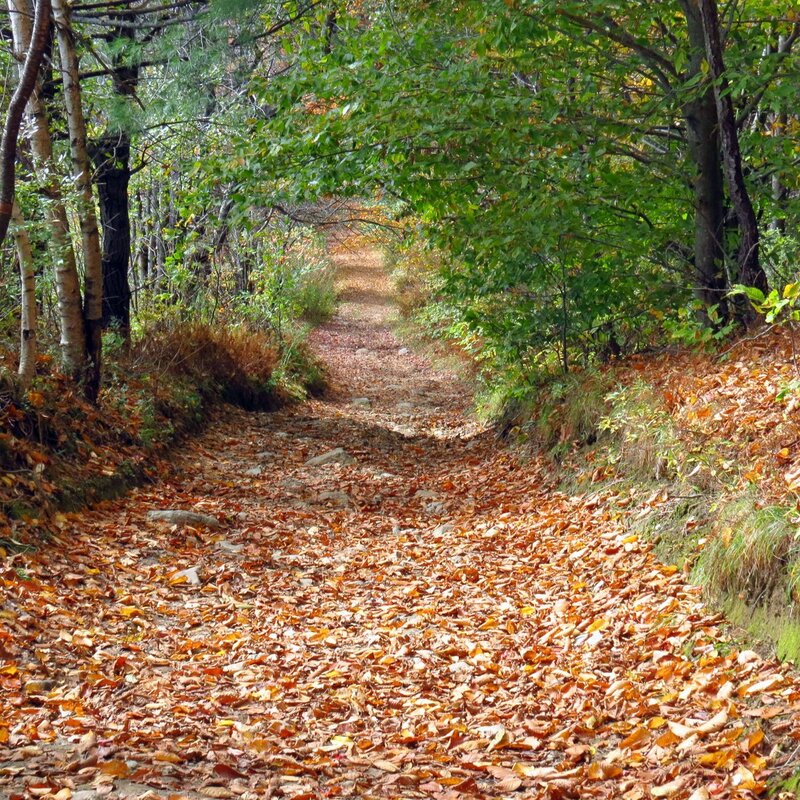 Before you move on down the trail there’s a good chance that you’ll see something else that catches your eye. Almost there. Enough dilly dallying. I was high enough now to look out over the forest I had just come through. It’s called the Andorra Forest and it seems to stretch into infinity. 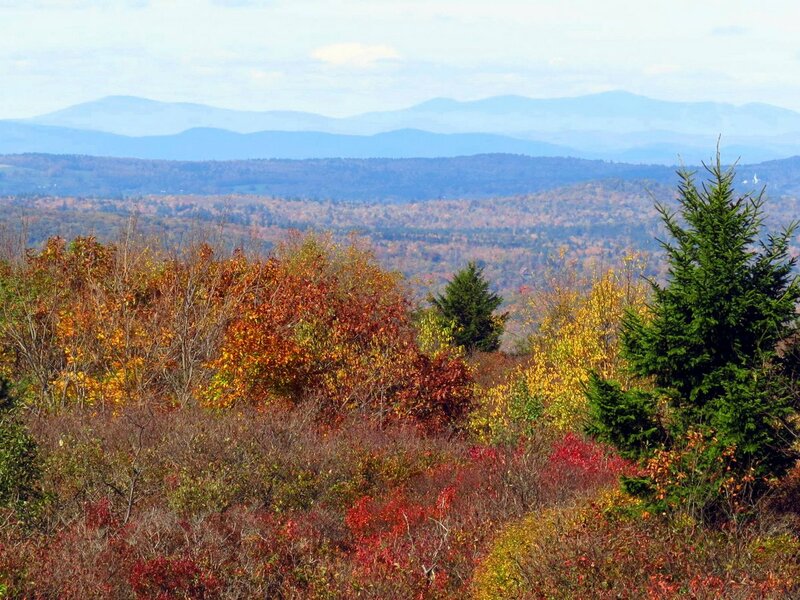 Views like this one in the fall let you pick out individual trees because of their varying color and show just how staggering the number of trees here really is; 4.8 million acres of them. 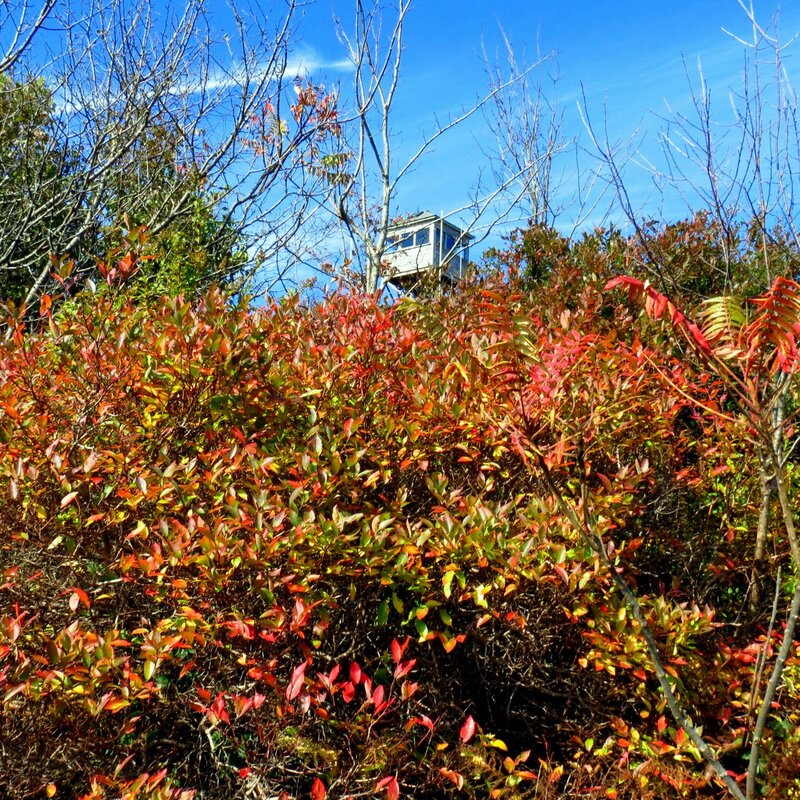 I could just glimpse the fire tower through the glowing blueberries and sumacs. From here on is the shortest but steepest part of the trail so I stop at the old ranger’s cabin to catch my breath and prepare for it. 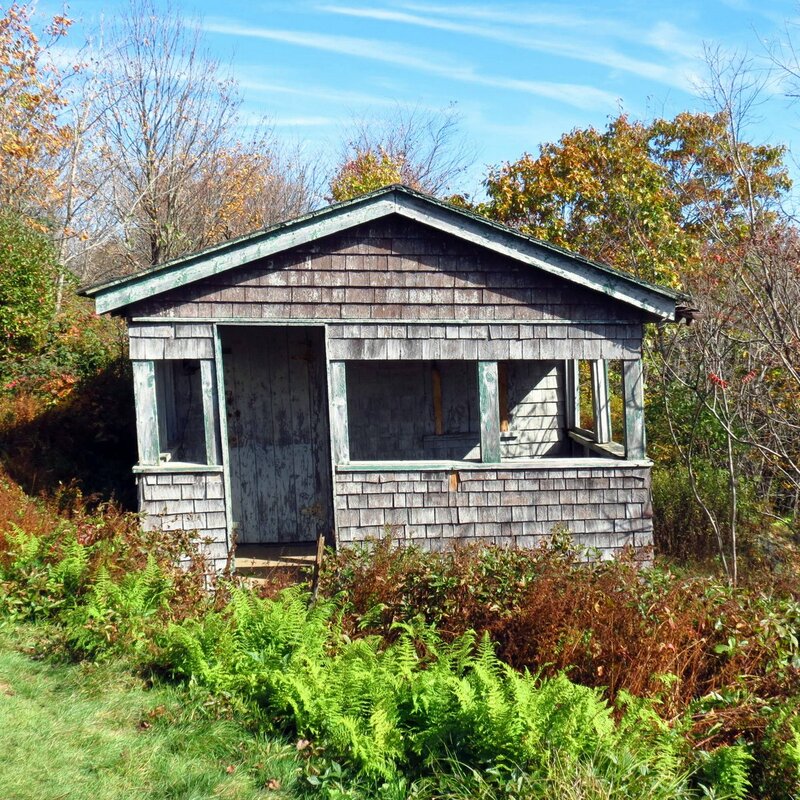 I don’t know the history of this cabin but it’s certainly big enough to have held at least 4 people at one time. I’m assuming that people lived here when the fire tower was manned daily. The cabin looks like it’s leaning even more to the left, into the mountainside. 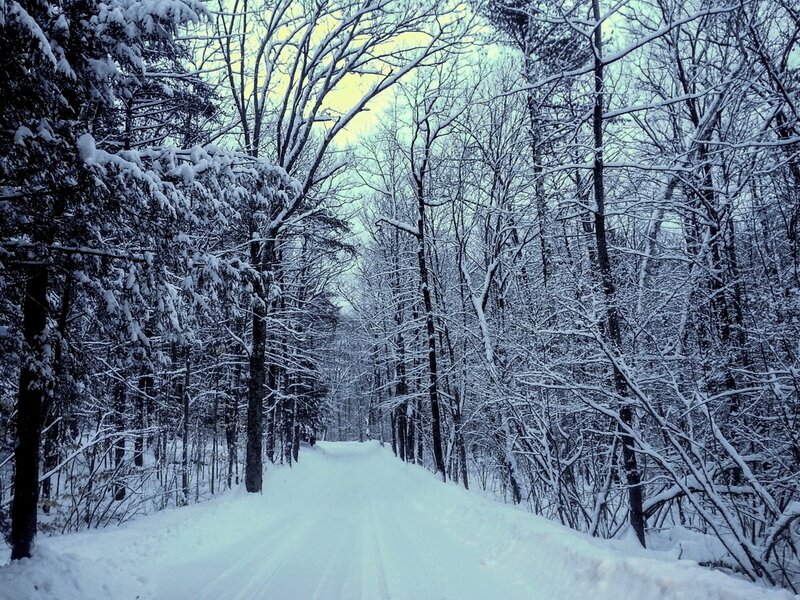 How it takes the heavy snow load each winter is anyone’s guess. Just a few more steps and I’d be on the summit. I was happy (and a tiny bit surprised) that I’d made it. 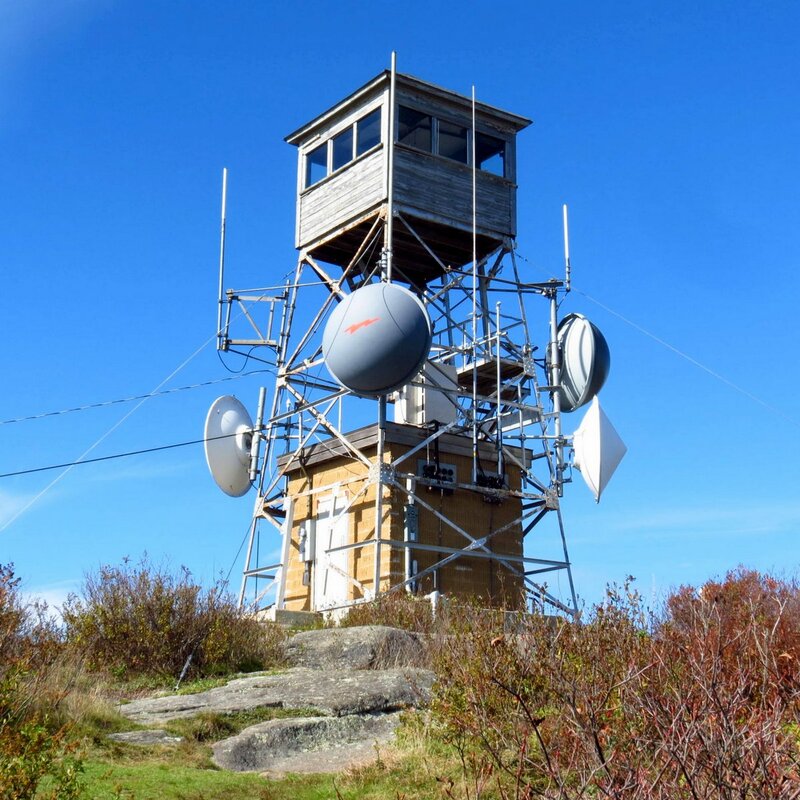 I call the fire tower a monument to irony, because in 1940 the original 1915 built wooden tower burned to the ground, along with 27,000 acres of forest and all the trees on the summit. It was one of the worst fires in state history but it is because of that fire that today we have a full 360 degree view from the summit. 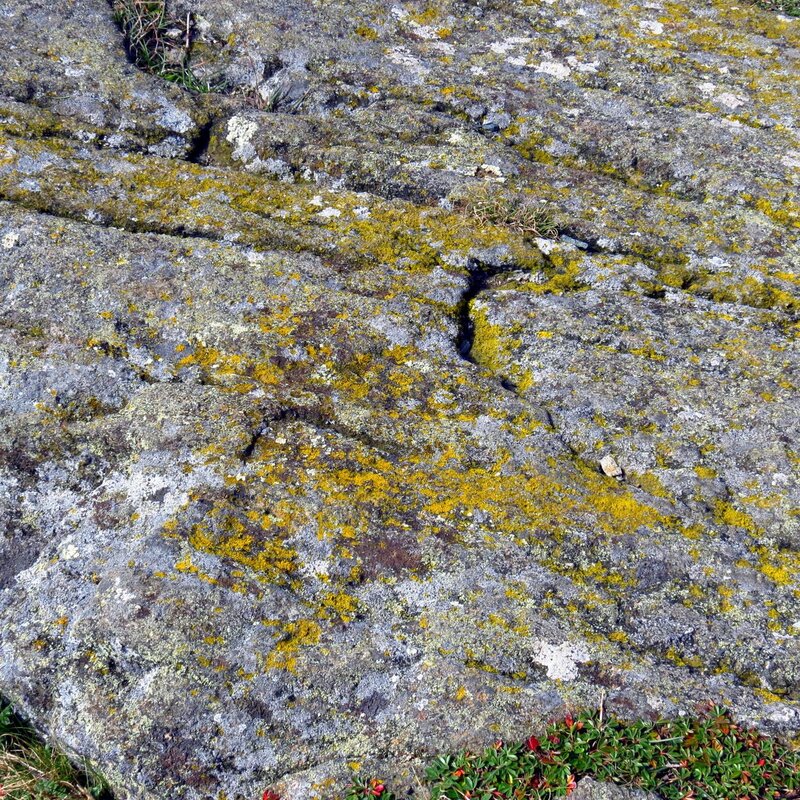 The bedrock showing on the summit is covered in lichens. 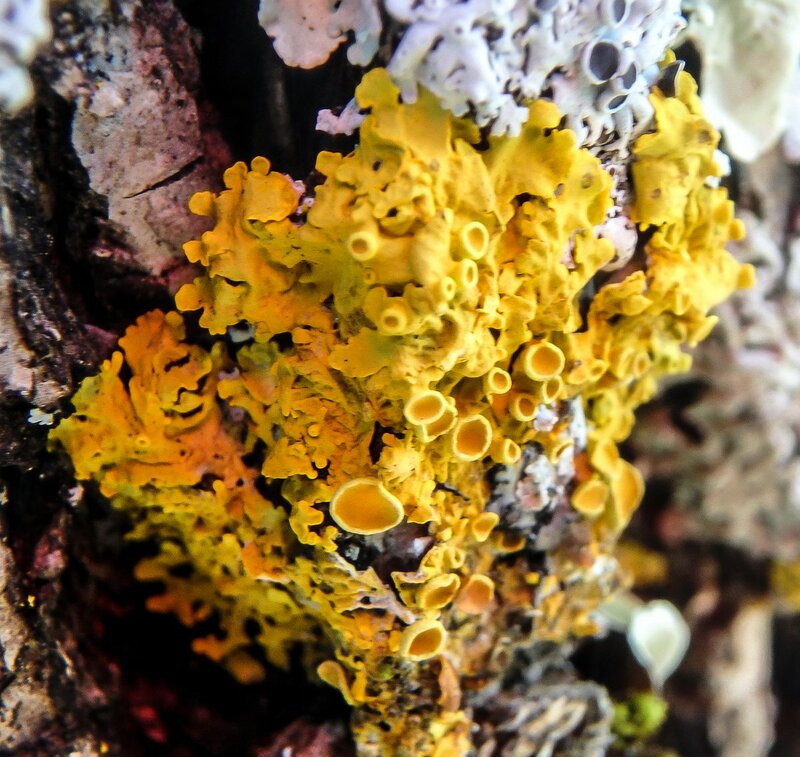 Common goldspeck lichen (Candelariella vitellina) is a crustose lichen, which means it grows like a crust and probably couldn’t be removed without damaging whatever it is growing on. 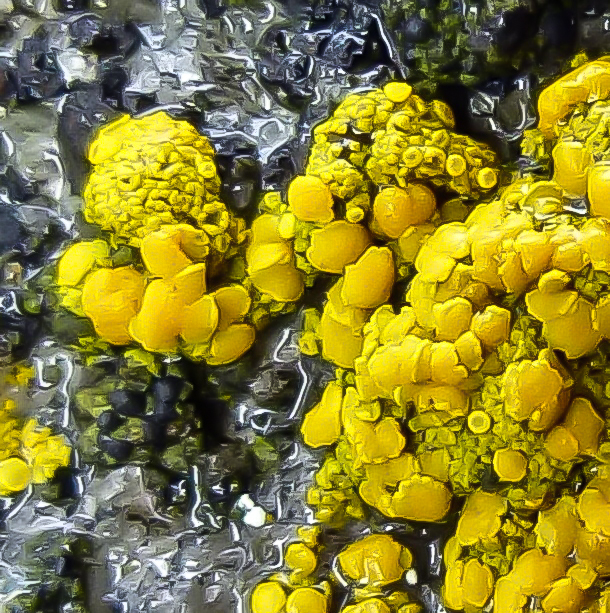 This lichen contains a yellow pigment called calysin and was once used to dye wool yellow in Sweden. It must have been very hard work scraping it off the stone and yellow wool must have been very expensive. One of the first things I look for at the summit is what I call the “near hill.” I was a little disappointed that the colors weren’t brighter and didn’t “pop” more. Capturing fall color from above is a lot harder than one would think. I’ve tried many times, from many different hills and mountains, and I really haven’t ever been completely happy with the results. It was very beautiful up close but harder to see the colors far away. 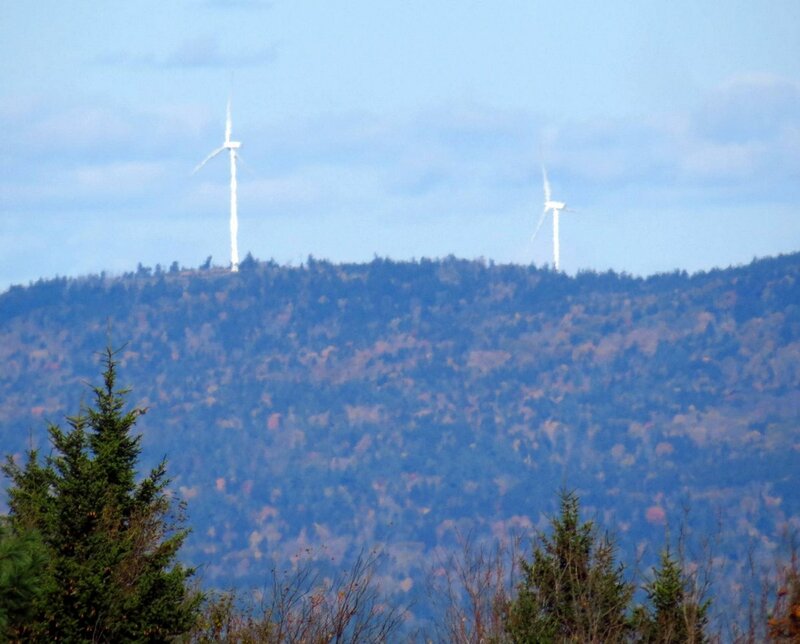 I could just see the whirligigs over on Bean Mountain in Lempster. I couldn’t tell but they must have been spinning fast. The wind was brisk to say the least, and the camera had a hard time with them through the haze. Jerry from the Quiet Solo Pursuits blog thought the fall colors would look better with a blue sky behind them so I conjured a bluish one up and here it is. I told Jerry that I found when the sun is behind me a photo will almost always show blue water, and I wondered if the same might be true with the sky. As you can see from these photos in many the sky is milky white and in some it’s blue, and I think it must have a lot to do with where the sun was when I took the photo. I’m going to have to pay closer attention to see if it really does work that way. By the way, if you’re a nature lover, especially a bird lover, you really should be reading Jerry’s blog. You can find him right over there in the “Favorite Links” section under Quiet Solo Pursuits. 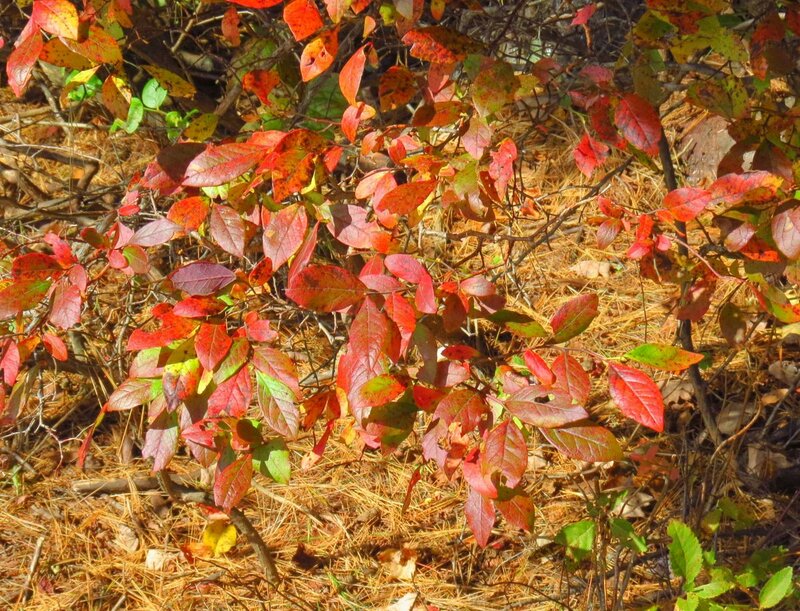 His latest post shows the glorious fall colors found in Michigan. 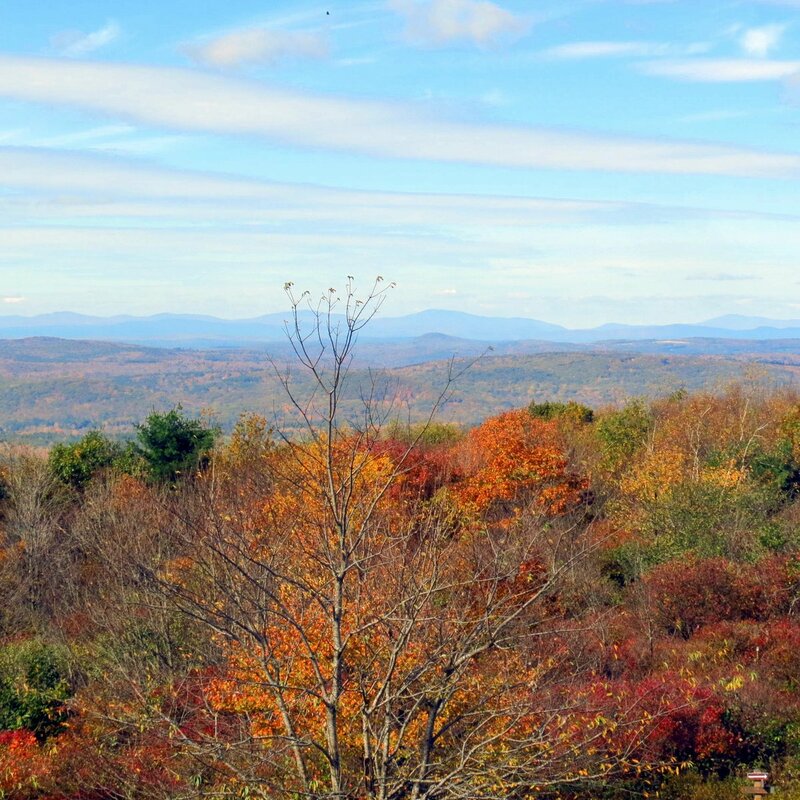 I met some people from Stoddard up on the mountain who told me I had missed the peak colors by just a few days. “Last Tuesday was best,” they said. Oh well, as Forrest Gump’s momma always said: Life is like a box of chocolates, you never know what you’re gonna get. 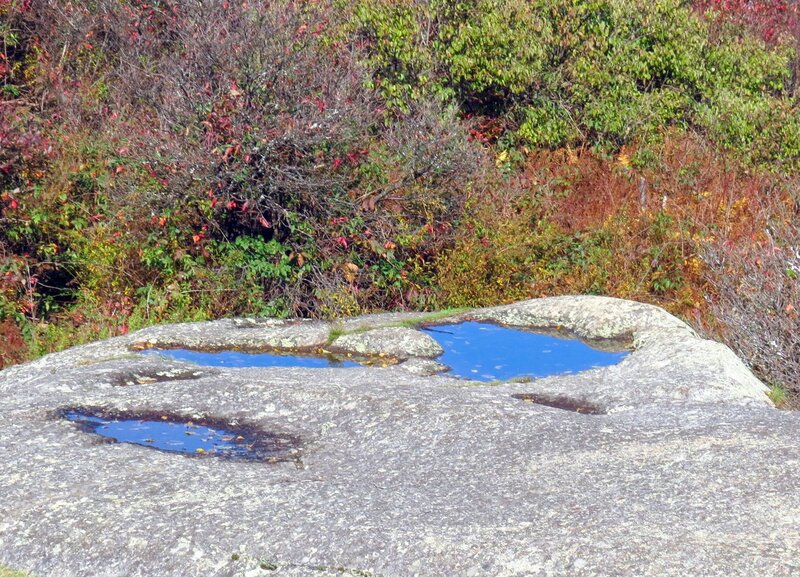 It had rained the day before my climb so I wasn’t surprised to see the depressions in the stone filled with water. I’ve always called them bird baths and a year or two ago a dark eyed junco let me sit and watch it bathe right here. There was another oak turning orange and prodding me on to Willard Pond so I don’t miss the show there. 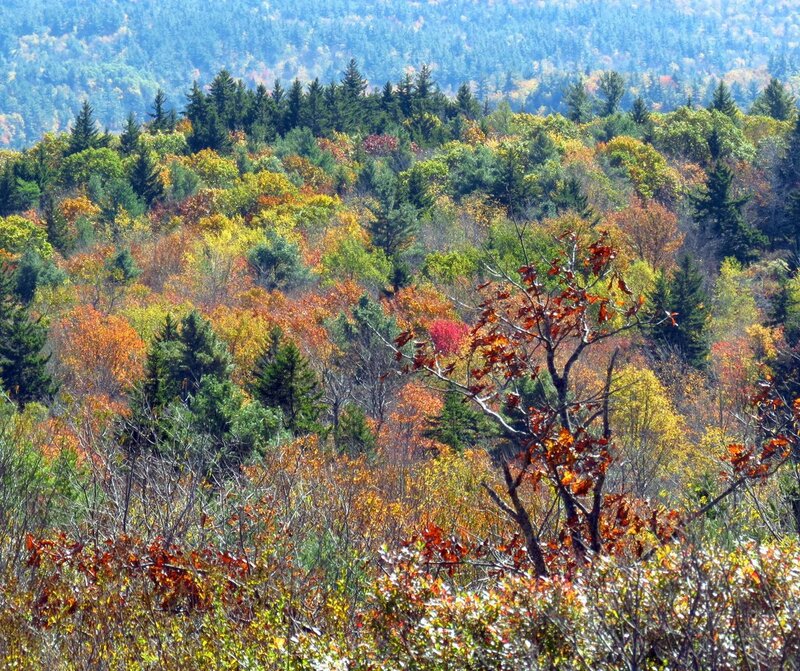 We’re not done yet; there is more fall color to come. The oaks there blaze with bright orange and the beeches are lemon yellow and together they often put on an unforgettable show. Going down was easier on the lungs but harder on the legs and I guess that’s the price you pay for climbing. I had a smile on my face though and I had met a few interesting people and had seen many beautiful things, so I’m not sure I could imagine a better day. I hope you’ll have one just as good real soon. After a cold December and the eighth warmest January on record, February is doing it again; we’ve had so many storms in the first two weeks I’ve lost track. This view is of my back yard after one of them; a light one, by the looks. We’ve also had cold, but not much of the bitter below zero kind. 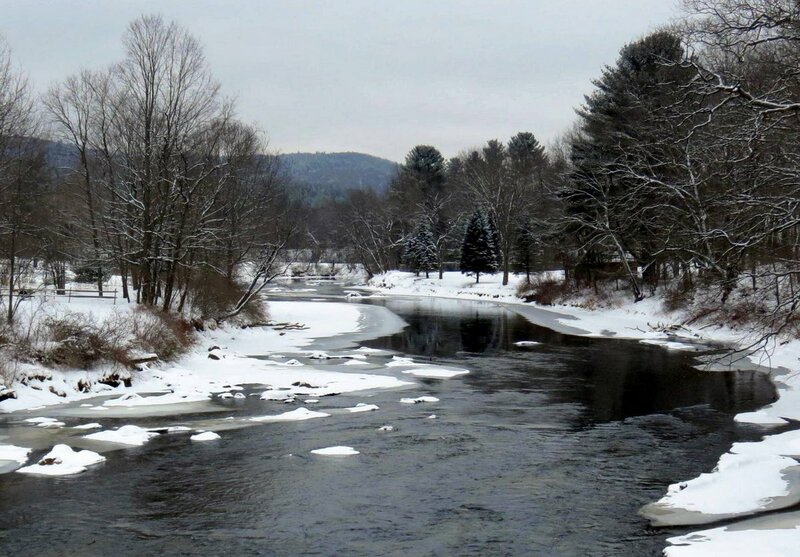 Still, as this view of the Ashuelot River in Swanzey shows, temperatures in the teens for a few days are enough to get rivers freezing. We’ve had plenty of wind too, and below zero wind chills one day. Because it has been so cold when the snow falls it falls as light powder which blows and drifts easily. 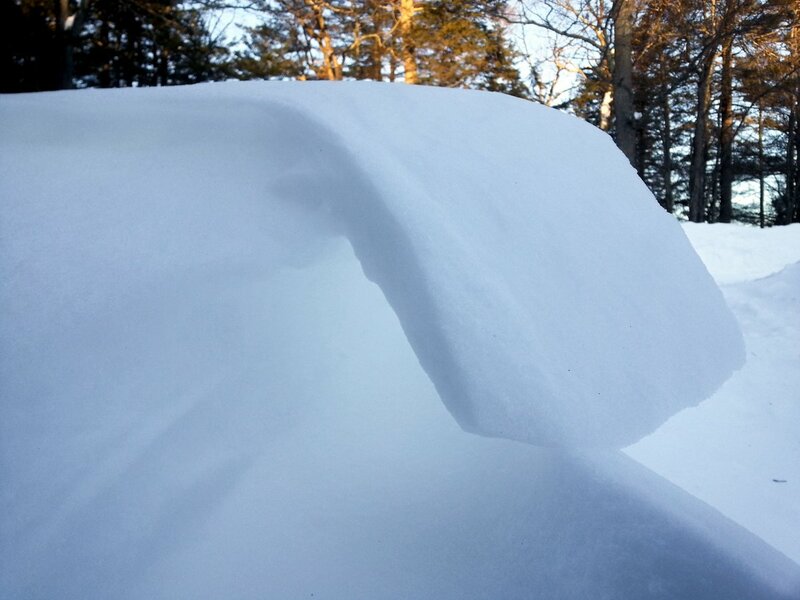 In one spot it had been blown into a snow wave; curled just like an ocean wave. 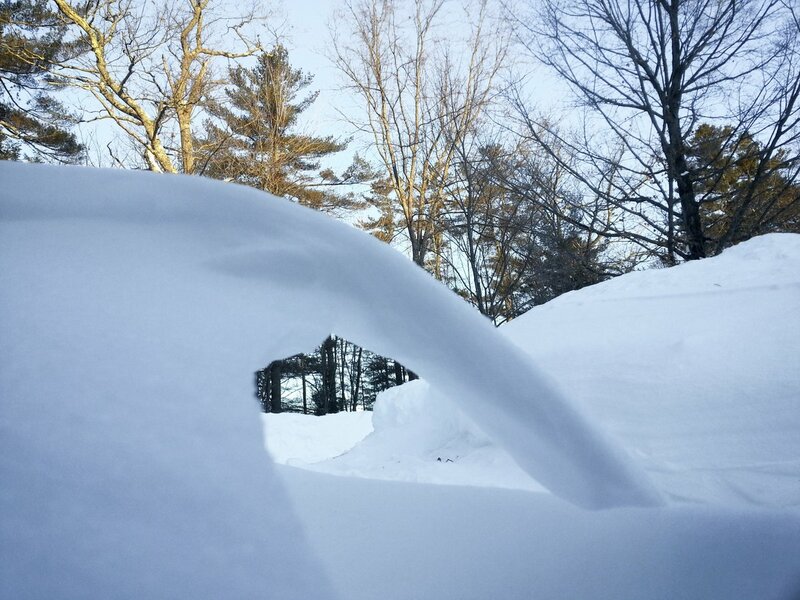 I tried to be clever and get a photo through the curl of the snow wave but all I had was my cell phone so it didn’t work out very well. 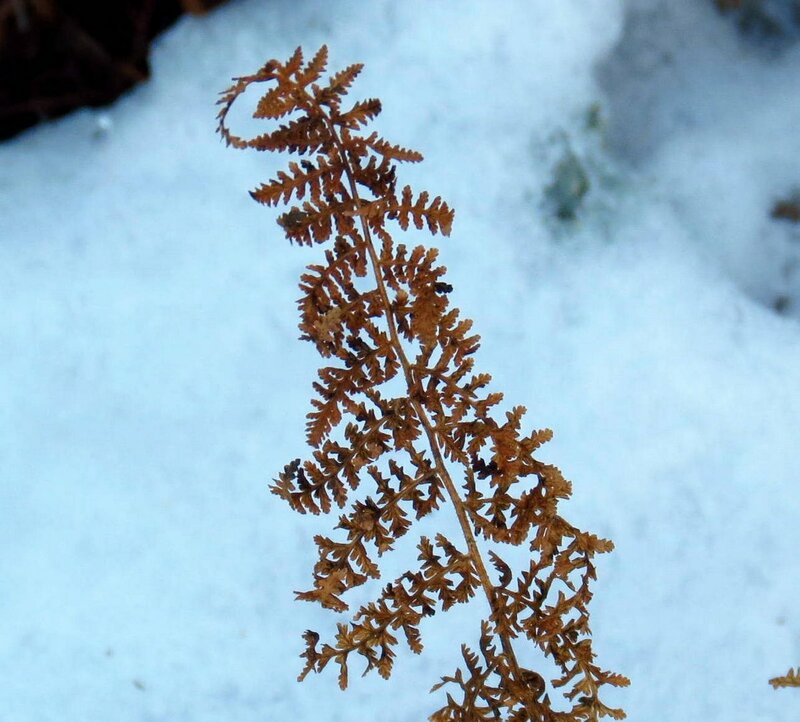 I was trying not to get snow all over the phone while kneeling and bending in the snow. Unfortunately the river is on the low side and calm, so I couldn’t get any photos of waves at my favorite spot for wave watching. With the drought last summer cancelling most of the wave action I’m starting to feel wave deprived. 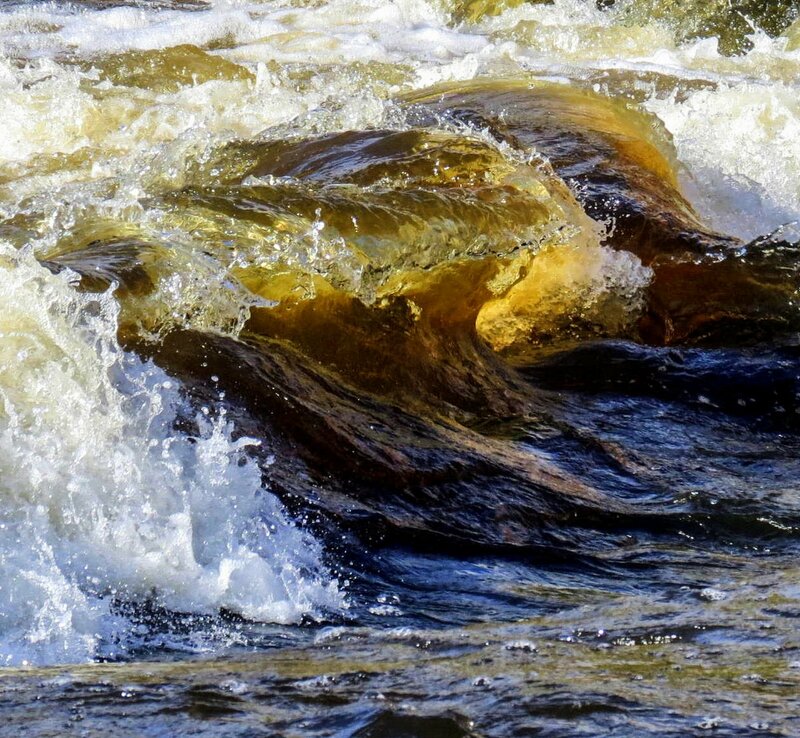 I love to see if I can tune in to the rhythm of the river and click the shutter at just the right moment. 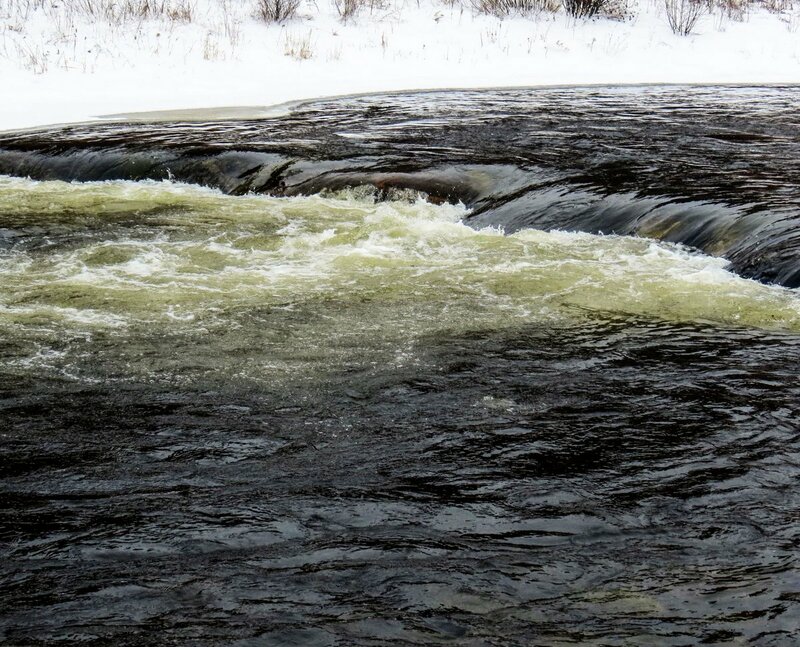 This earlier photo of river waves shows what I was hoping to see, but we need more rain or snow melt to make this happen again. And then we’ll need some sunshine too. 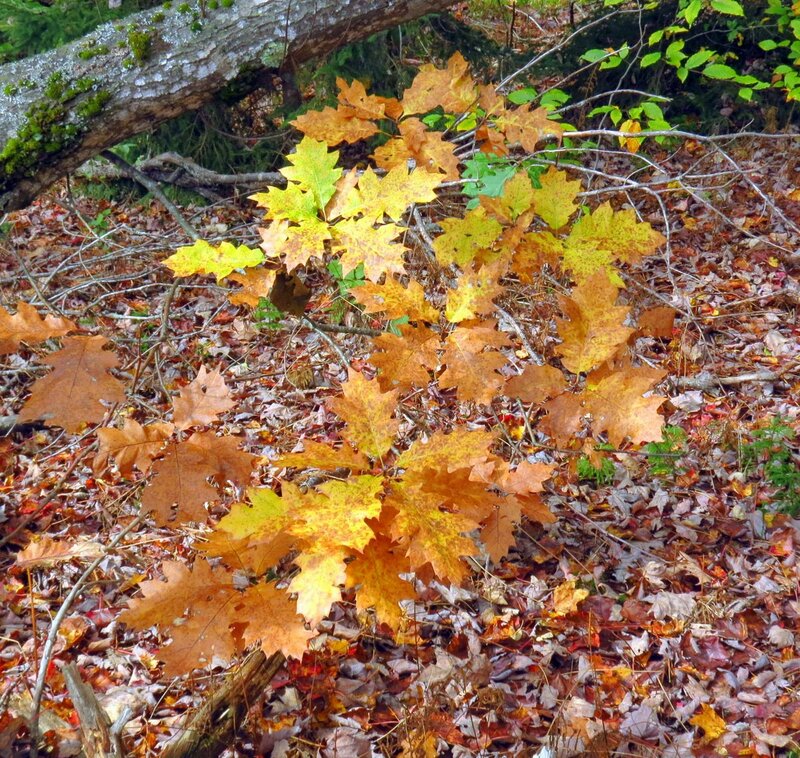 I love the beautiful rich, warm orange brown of oak leaves in winter. 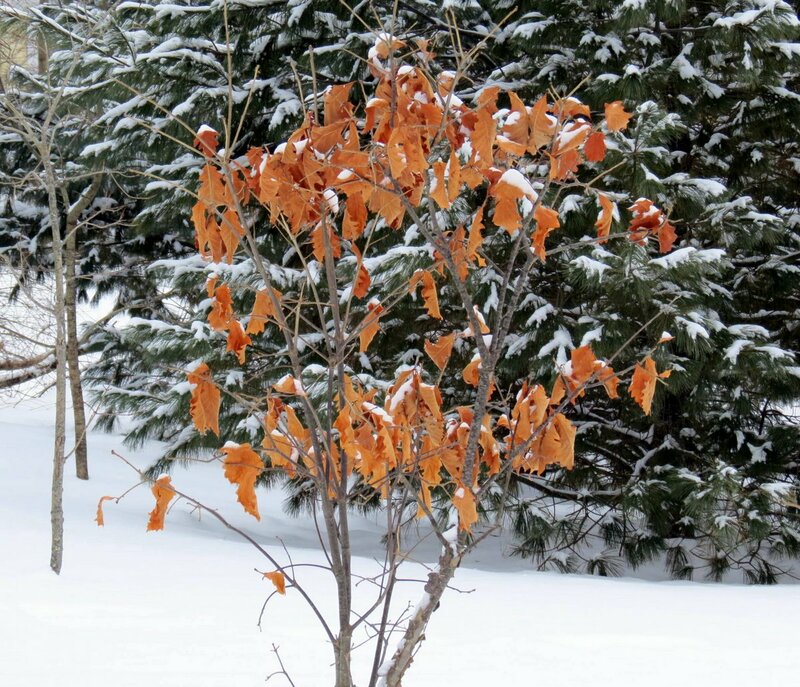 They and beech always add a little color to the winter woods. And quite often add sound as well, when the wind blows. I’m not the only one who appreciates oaks in winter; a deer came along and ate buds from this branch. They’re having a rough time of it this winter I think, with lots of snow on top of ice it’s very hard to get around. I tried to wade through knee deep snow the other day without snowshoes on and was quickly turned back. I’m not young enough for that anymore. It’s exhausting. 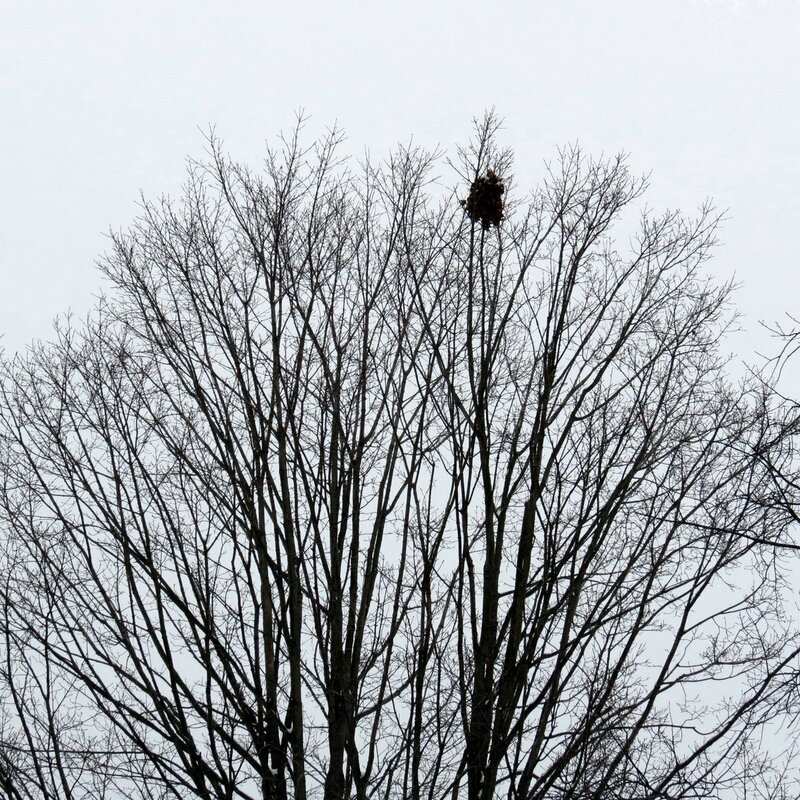 I saw what looked like a bundle high up in the top of a tree one day. A closer look showed it to be a bundle of leaves; a gray squirrel nest. 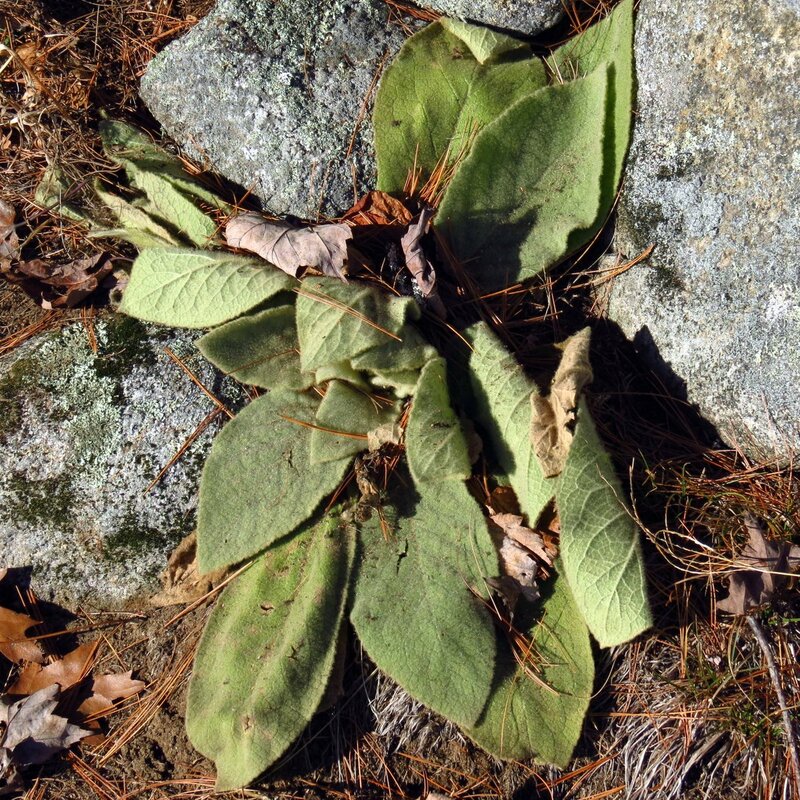 Leaf nests start with a floor woven from twigs with damp leaves and moss packed on top. A spherical framework is woven around the base and leaves, moss, and twigs are stuffed into it until a hollow shell of about 6 to 8 inches across has been created. Gray Squirrels can have nests that are up to 2 feet wide. This one was quite big; at least the size of a soccer ball. 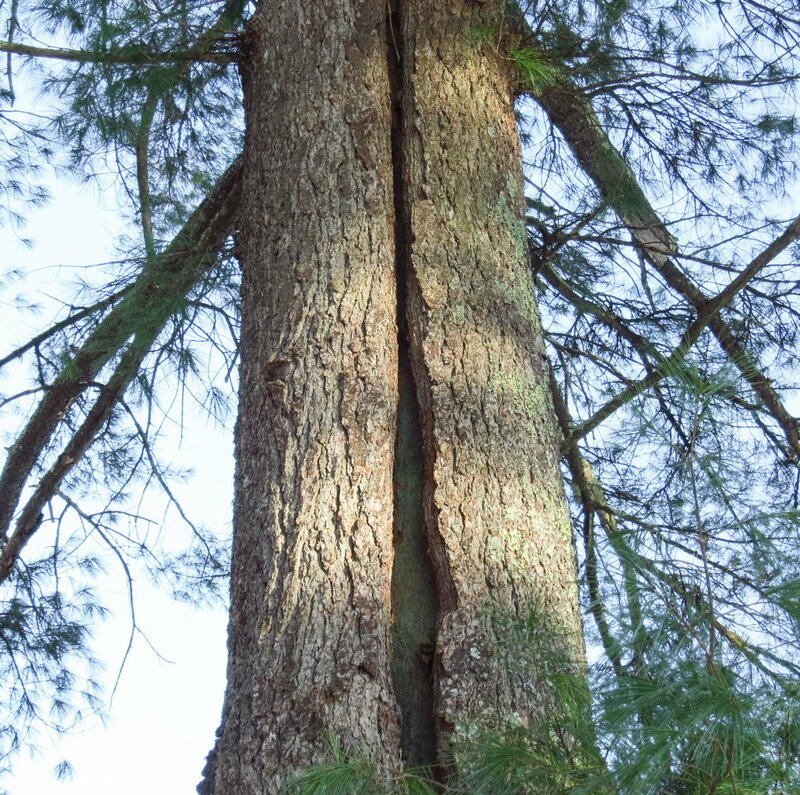 Squirrels will also use hollow trees as nests when they can find them. Last spring I saw a hollow tree with three baby gray squirrel heads poking out of a crack, but of course I didn’t have a camera ready. 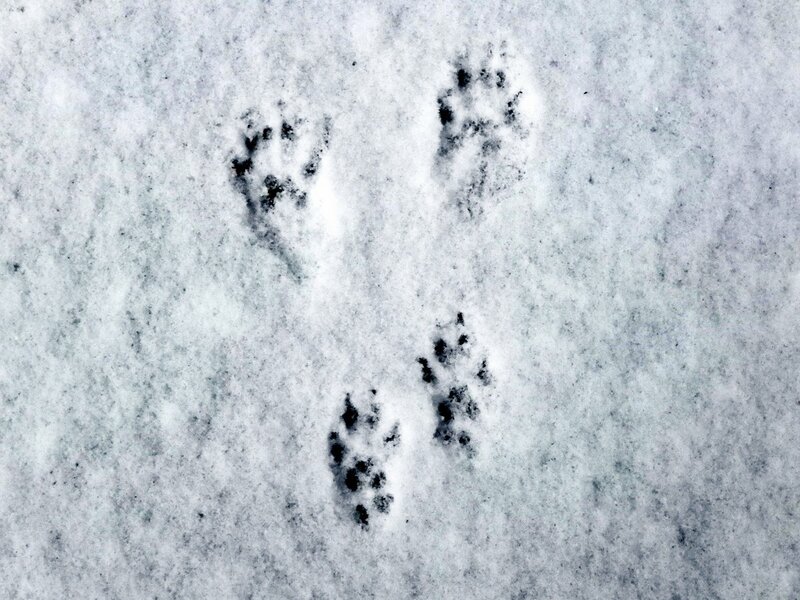 Gray squirrels have 4 toes on their front feet and 5 on their rear feet, and when they’re bounding along at speed the tracks have the smaller front feet behind the rear feet, as this photo shows. 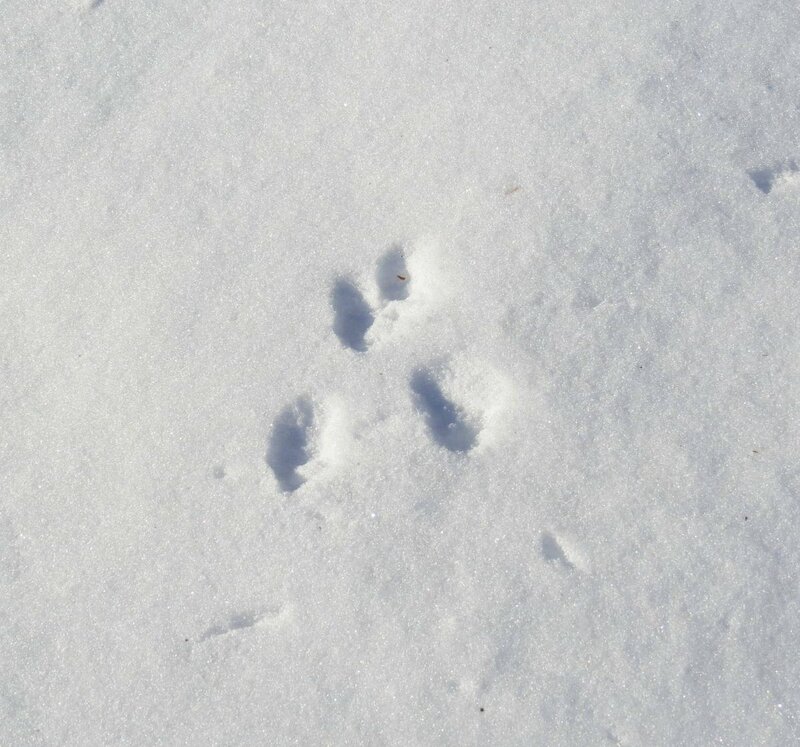 Gray squirrels don’t hibernate. I see them every day when it is warm enough, out foraging for nuts and seeds. Like deer they can have a hard time of it in the winter. Only 25% of gray squirrels survive their first year but those that do might live 4 or 5 years, and can have 2 litters of young per year. They were a favorite food of Native Americans. Some tribes considered the squirrel to be a messenger who often alerted them to danger. 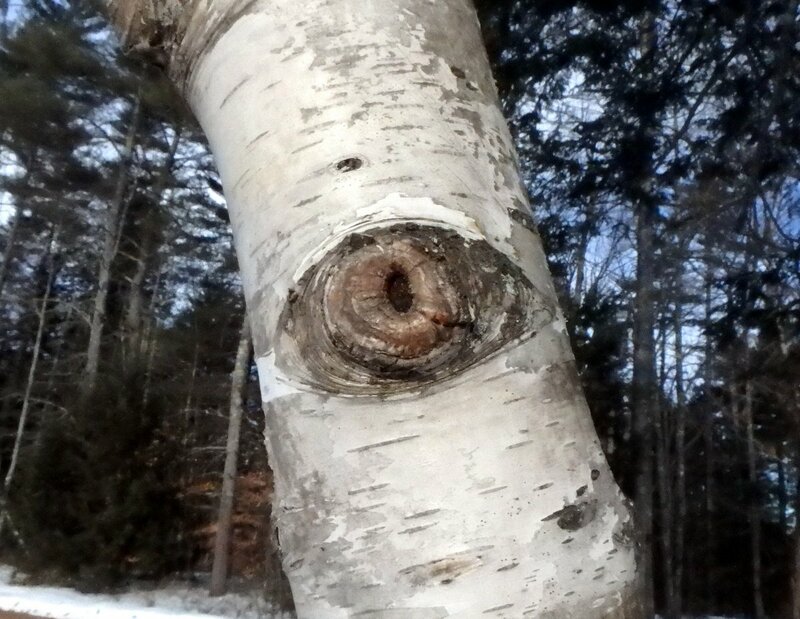 This birch tree seemed to be keeping an eye on things. 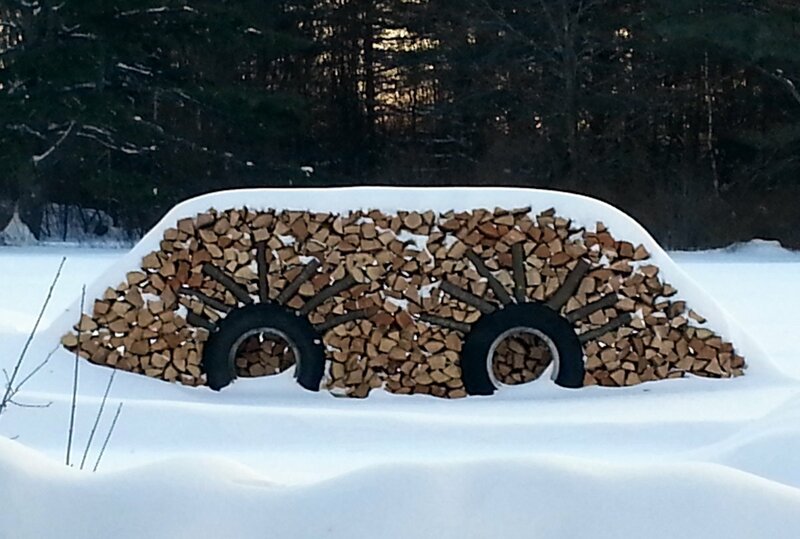 And so did this woodpile. 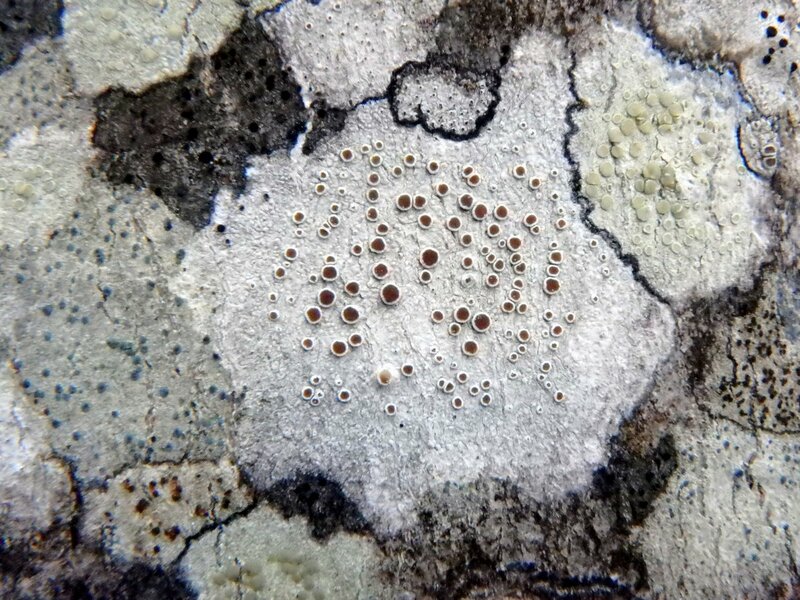 Even the lichens seemed to be watching with their many different colored eye like fruiting bodies (apothecia.) They were really vying for space on this tree that grows beside a pond, so they must all be moisture lovers. 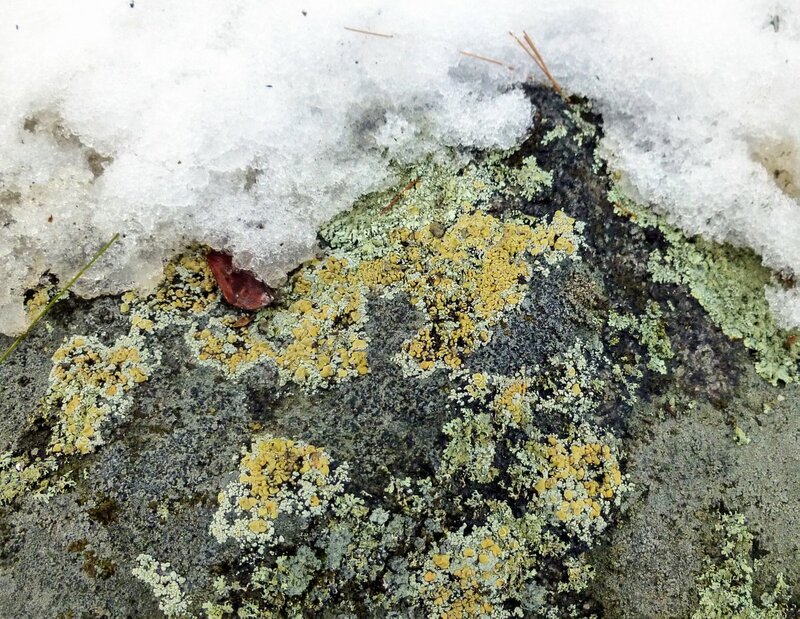 There are at least 6 different lichens in this photo. 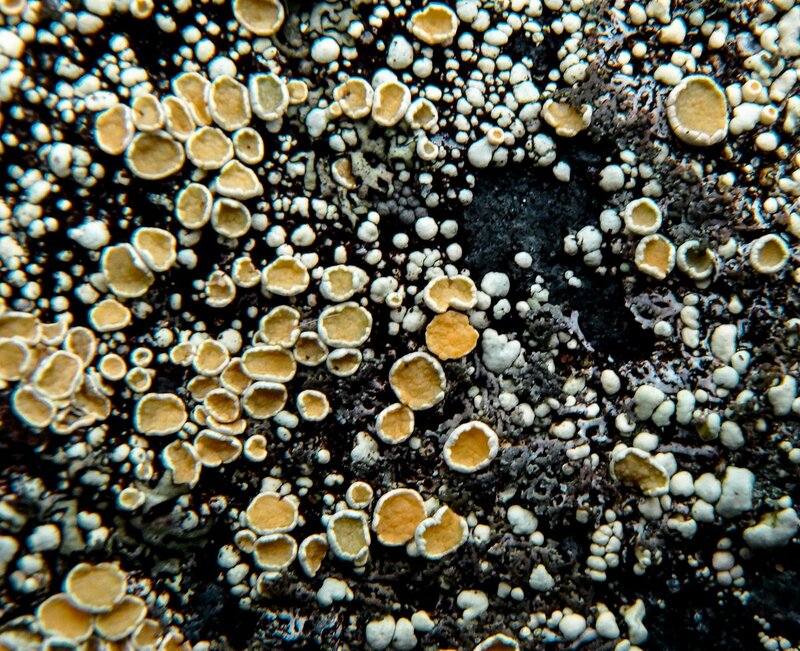 I think the large one in the center is a rosy saucer lichen (Ochrolechia trochophora.) 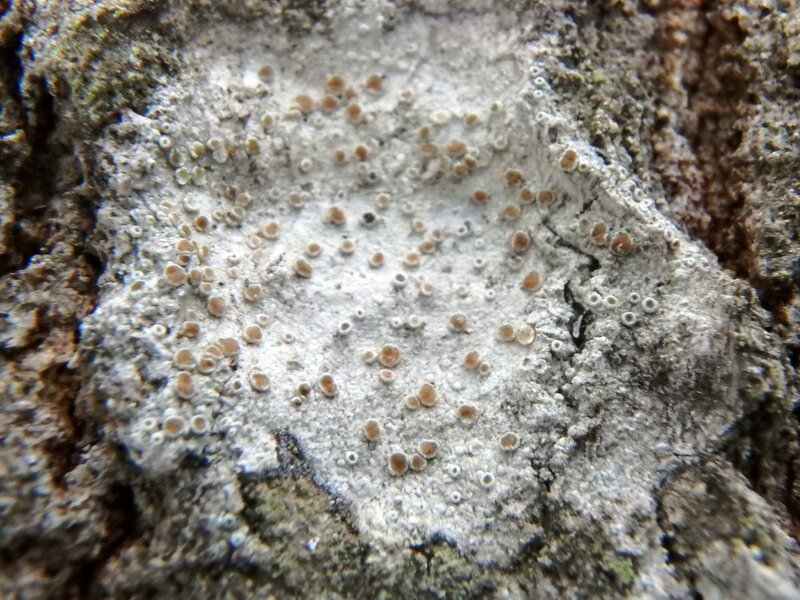 The color of its apothecia can range from pink to orange but these looked more red than pink or orange. Most of the grapes have been eaten by the birds except for a few unappetizing examples. We have quite a lot of wild fruit growing in this area and I keep hoping that it will attract Baltimore orioles, but I never see them. 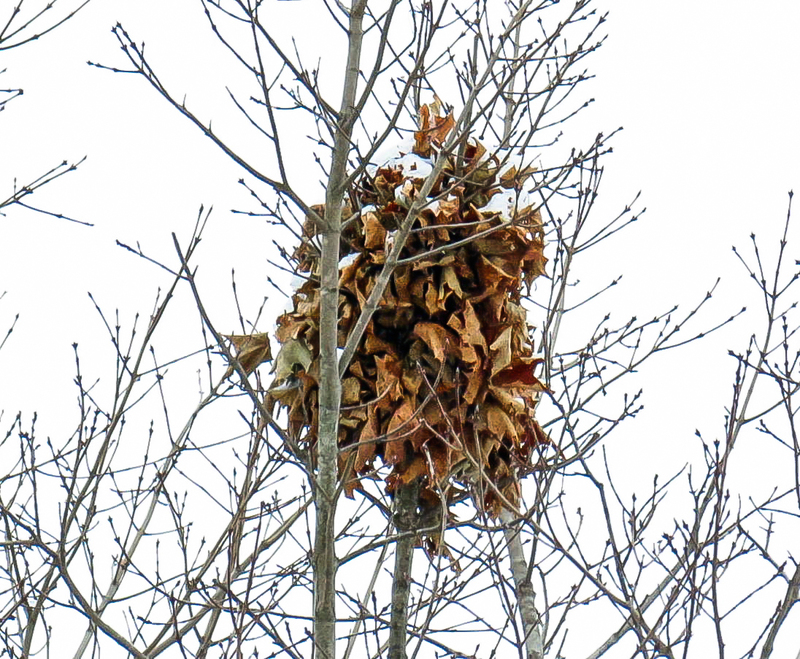 There used to be lots of them when I was a boy and I used to like seeing their hanging basket nests in the trees. I haven’t seen one in probably 50 years, since they cut down the last American elm on the street I grew up on. Galls are much easier to see in winter than they are in summer and some can be really interesting so I usually watch for them. 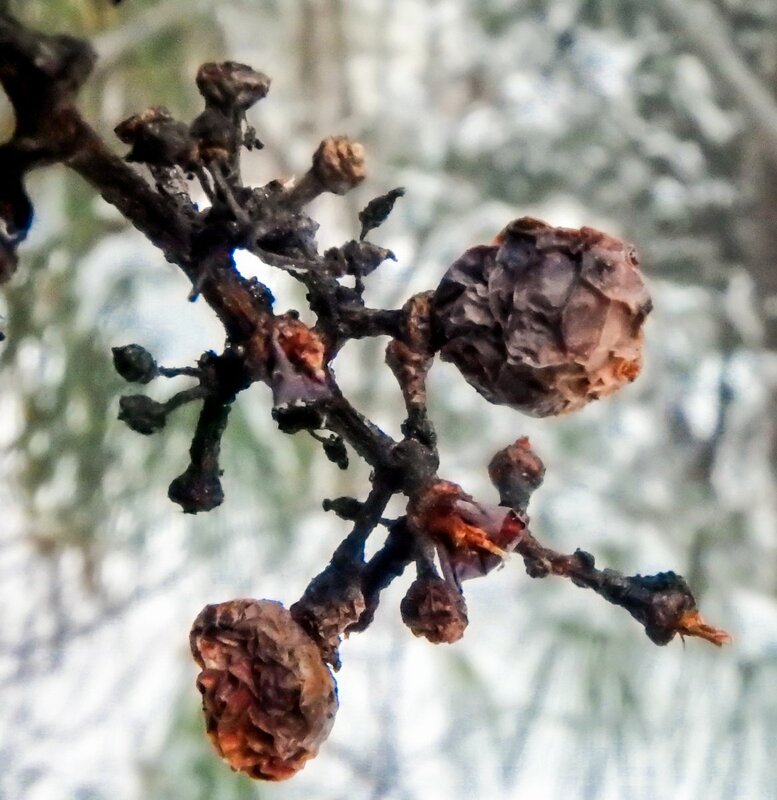 This is a stem gall which was formed when willow gall midges (Rhabdophaga) burrowed into the willow’s stem last year. These galls are usually red and are very hard and tough. I’m not sure if the holes in this example were made when midges burrowed out, or if birds burrowed in. 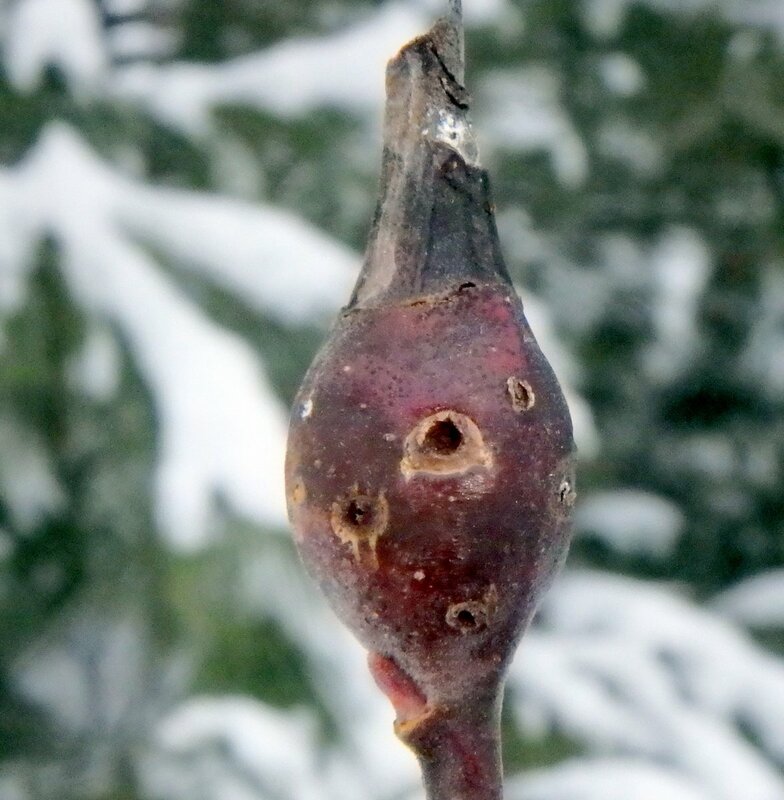 Many bids including wood peckers rob different galls of their larva. The small cups found on native witch hazel shrubs (Hamamelis virginiana) at this time of year are formed by four bracts that curve back. The strap like flower petals unfurl from these cups on warm fall days. 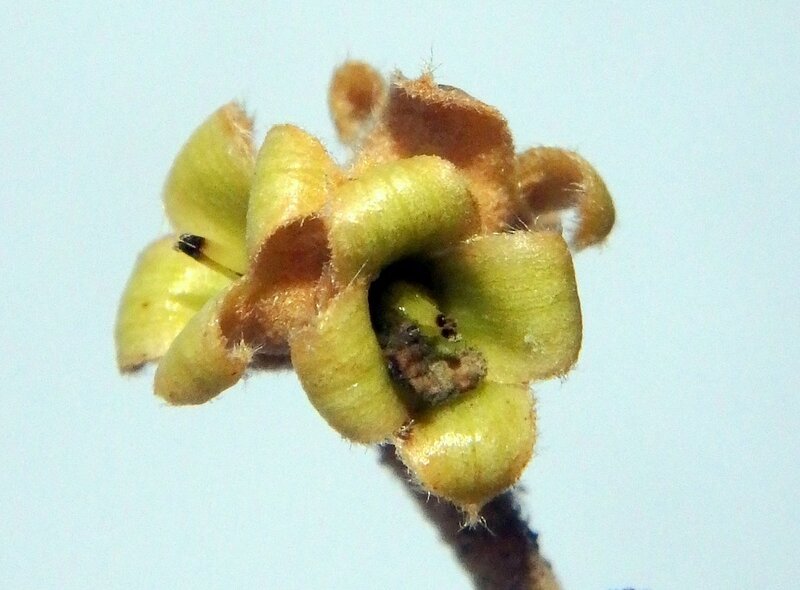 Soon the spring blooming vernal witch hazels (Hamamelis vernalis) will be unfurling their petals on warm days. 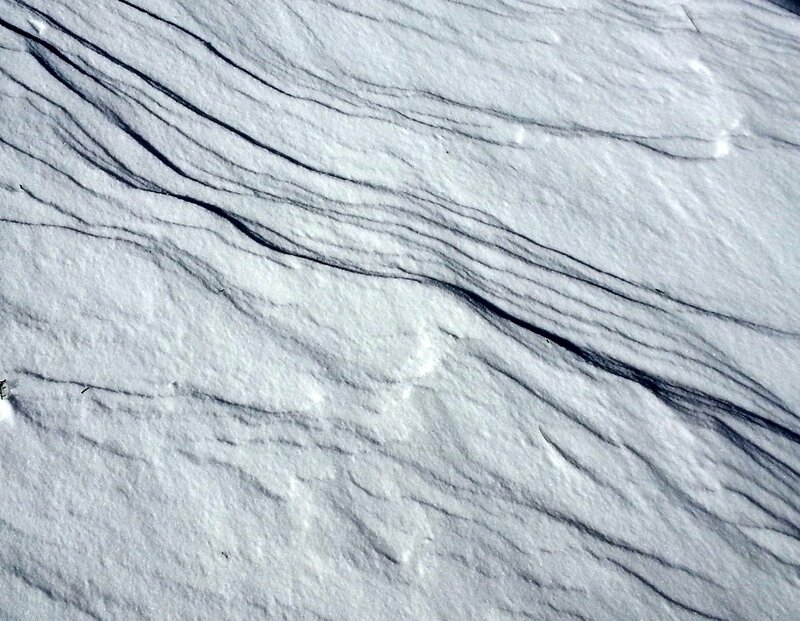 I wanted to get a photo of the way the windblown snow sparkled in the sunlight but instead it came out looking like white stone. This is what my approach to work looked like early one recent morning after another snowstorm. It’s very beautiful but I’m ready for the kind of beauty that is found in spring. 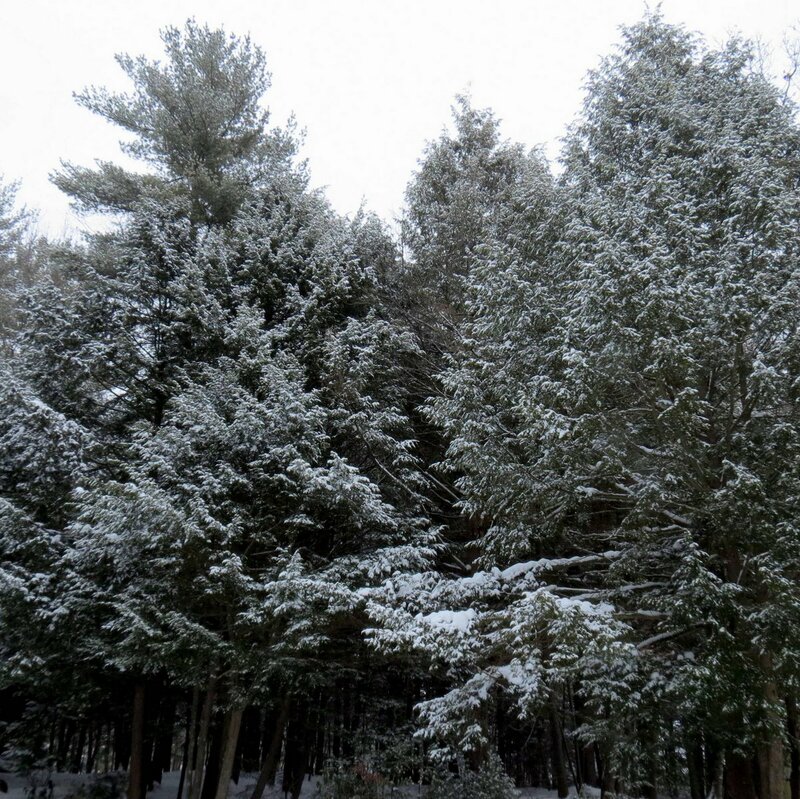 The outlook is good; the weather people say we’ll see above freezing temperatures from now well into March, so that means that our maple syrup season will start any day now. 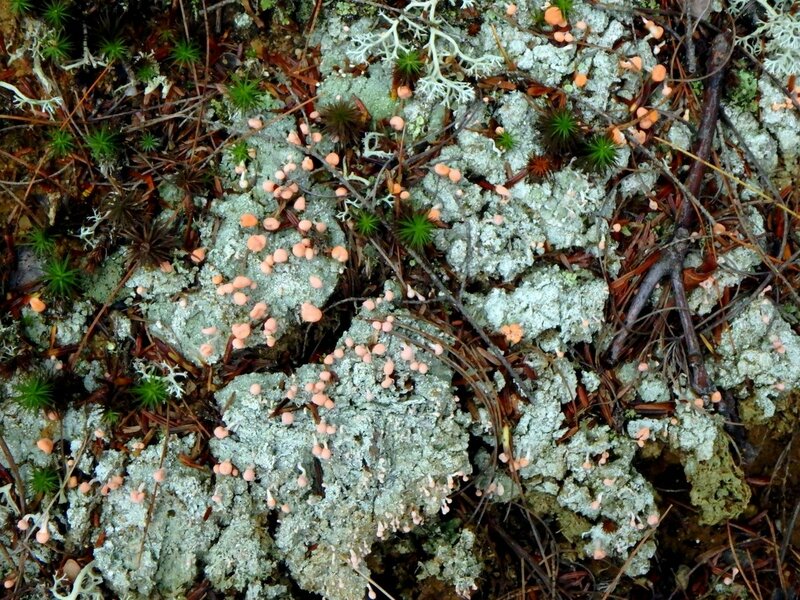 Pink earth lichen (Dibaeis baeomyces) closely resembles bubblegum lichen (Icmadophila ericetorum.) One of the differences between the two is the length of the stalks that the plump pink apothecia sit on. 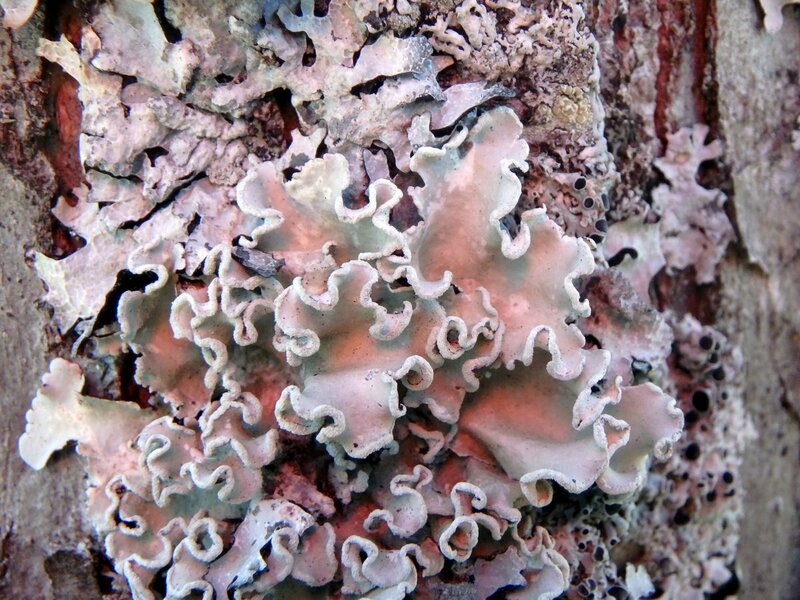 They are longer on bubblegum lichen than they are on pink earth lichens. Both are very beautiful things that are rarely seen in this area. 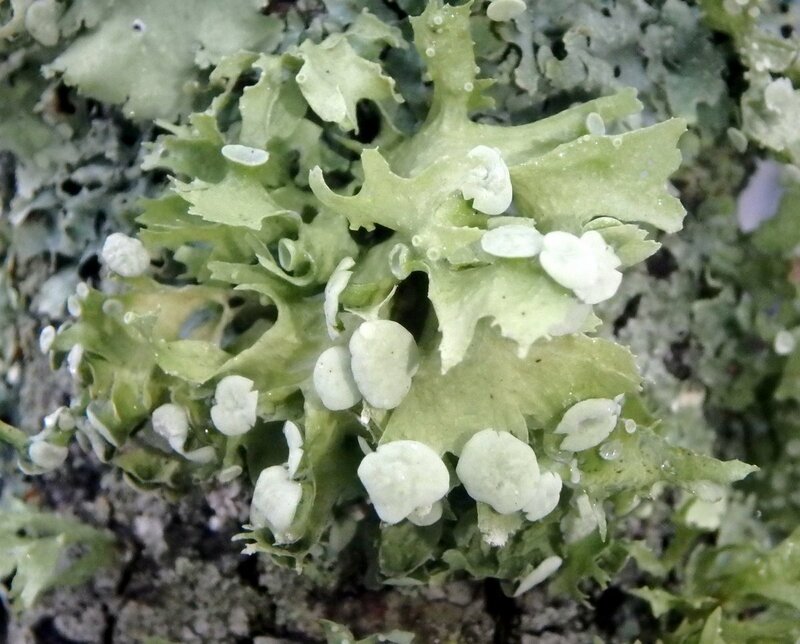 The whitish thallus, or body of the lichen, grows on soil; usually on dry acidic soil near blueberry and sweet fern plants. Bright orange poplar sunburst (Xanthomendoza hasseana) is a beautiful lichen with its large disc shaped, sucker like fruiting bodies (apothecia) which are almost always showing. 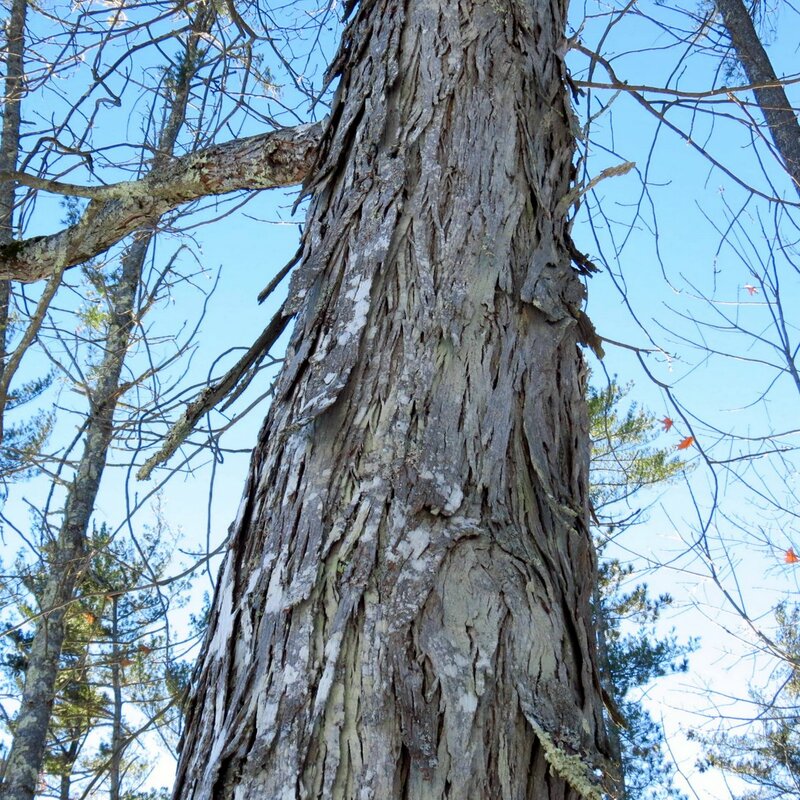 It’s found on tree bark and provides a lot of color in winter when there are no flowers to see. British soldier lichens (Cladonia cristatella) like to grow on damp wood like rotted stumps and logs, but I’ve found them on buildings, fence posts, and built up forest litter on boulders. At this time of year I don’t pass too many mossy old tree stumps without having a glance for British soldiers. 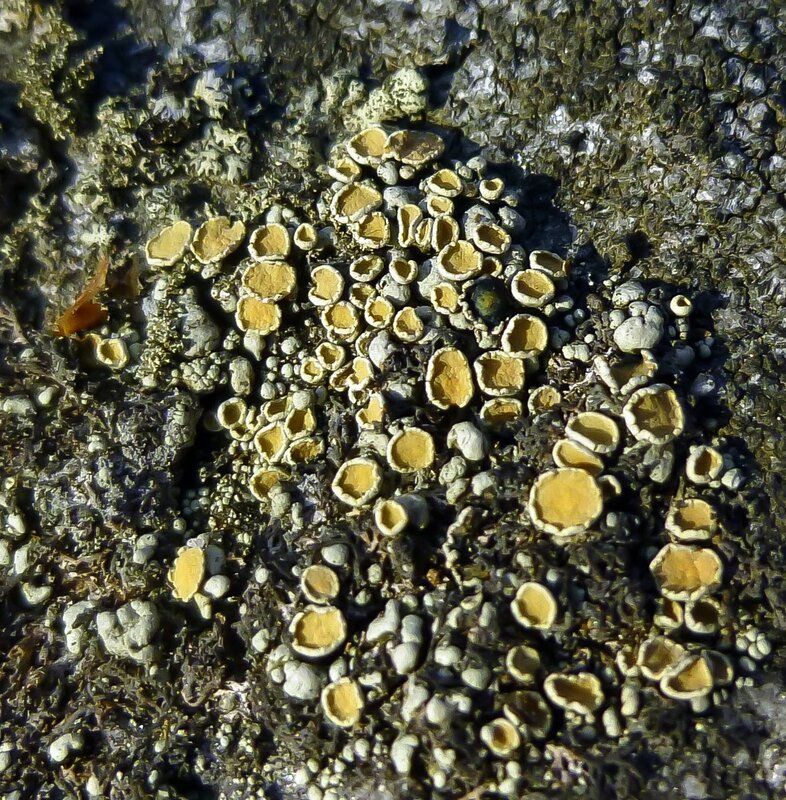 Scattered rock posy lichen (Rhizoplaca subdiscrepans) is both beautiful and unusual with its brain like body (Thallus) and orange fruiting discs (Apothecia.) This one was growing on stone in full sun. It is about as big as a quarter now, but when I first met it years ago it was about the size of a penny. Lichen identification can sometimes be tricky. Though it resembles scattered rock posy I think this is rosy saucer lichen (Ochrolechia trochophora.) It was growing on stone, but even though the book Lichens of North America says that it grows on tree bark a little further research on the website Images of British Lichens shows that it grows on tree bark or stone. 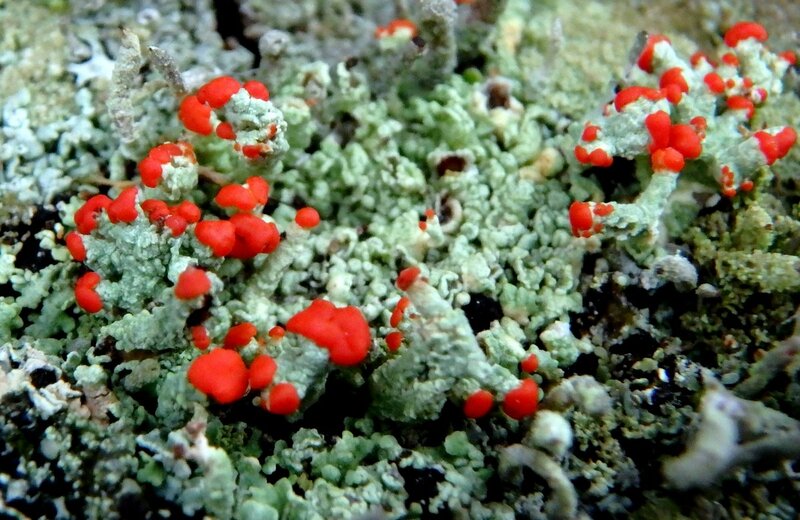 Based on that information and the fact that I can’t find a similar saucer lichen that grows in New England, I’m going with rosy saucer lichen. 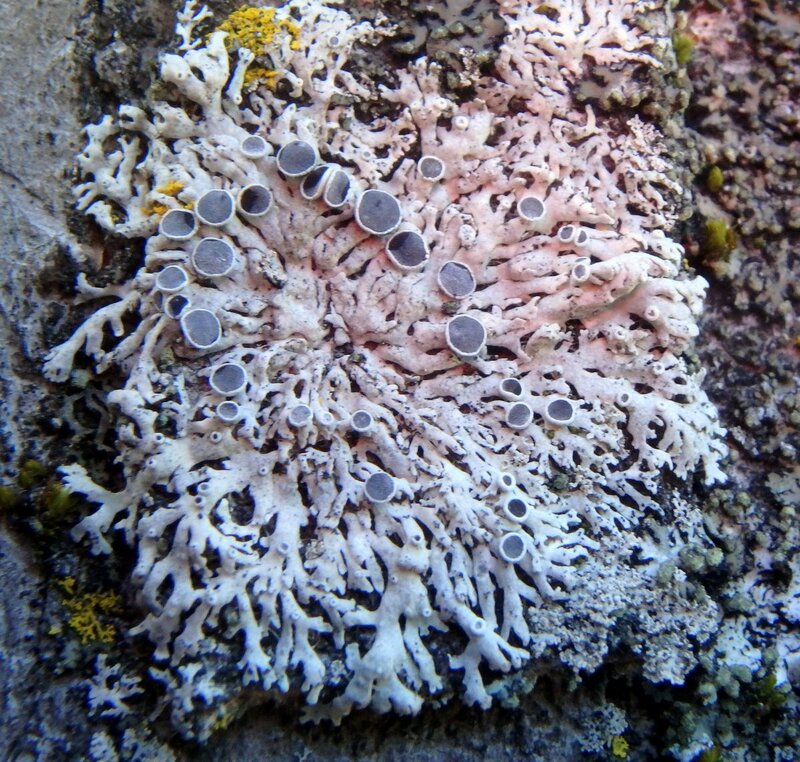 Even though it has rosy in its name its apothecia can range from pink to orange, according to what I’ve read. 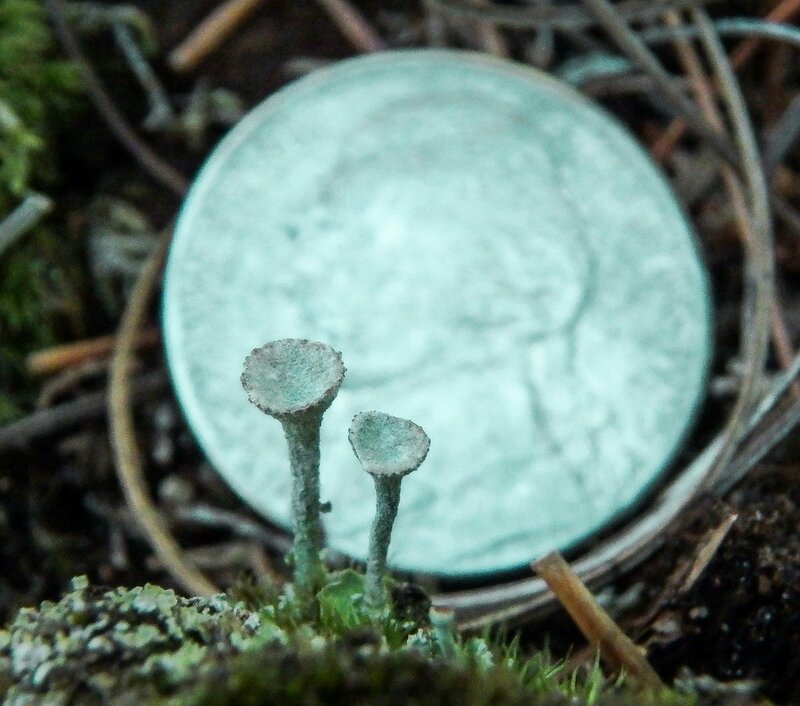 It didn’t work out very well but I put a nickel behind these pixie cup lichens (Cladonia asahinae) to give you an idea of how small they are. The photo came out looking like golf tees in front of a full moon. A nickel is .83 inches in diameter and the round cup of the golf tee shaped pixie cup might be .12 inches on a good day. You wouldn’t fit an average pea in the cup, but a BB from an air rifle might sit in one. 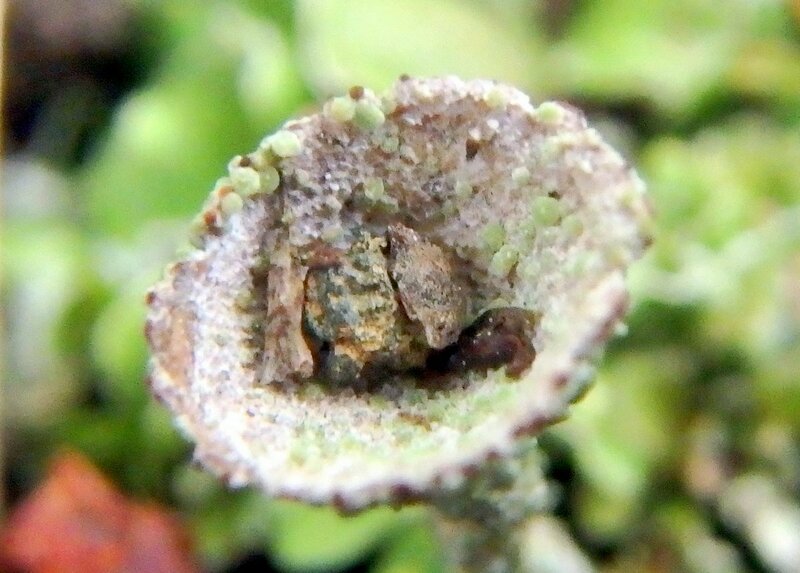 I had to really push my camera to get this shot so I could show you the inside of the cup of a pixie cup lichen. 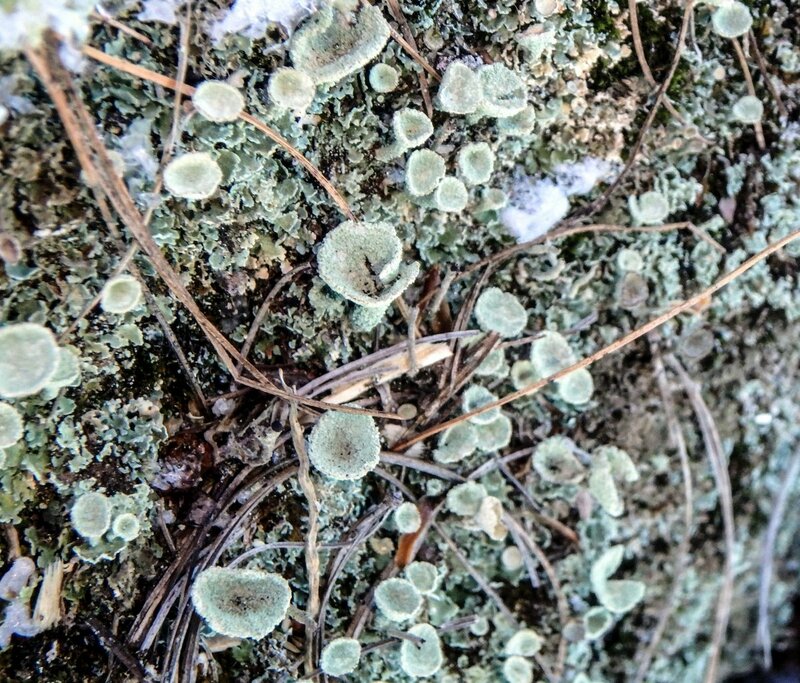 The nearly microscopic red dots on the rim of the cup are this lichen’s fruiting bodies (Apothecia.) 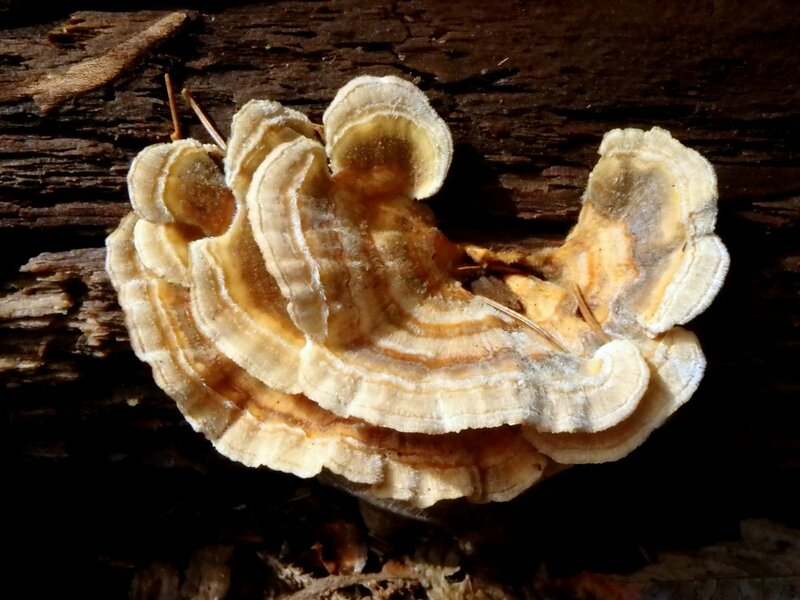 The tan colored scales are leafy growths called squamules. A squamule is a lobe of the body of the lichen (Thallus,) and some lichens are squamulose, meaning they’re made up of small, leafy lobes. I’m not sure what the objects in the cup are, but they’re extremely small. 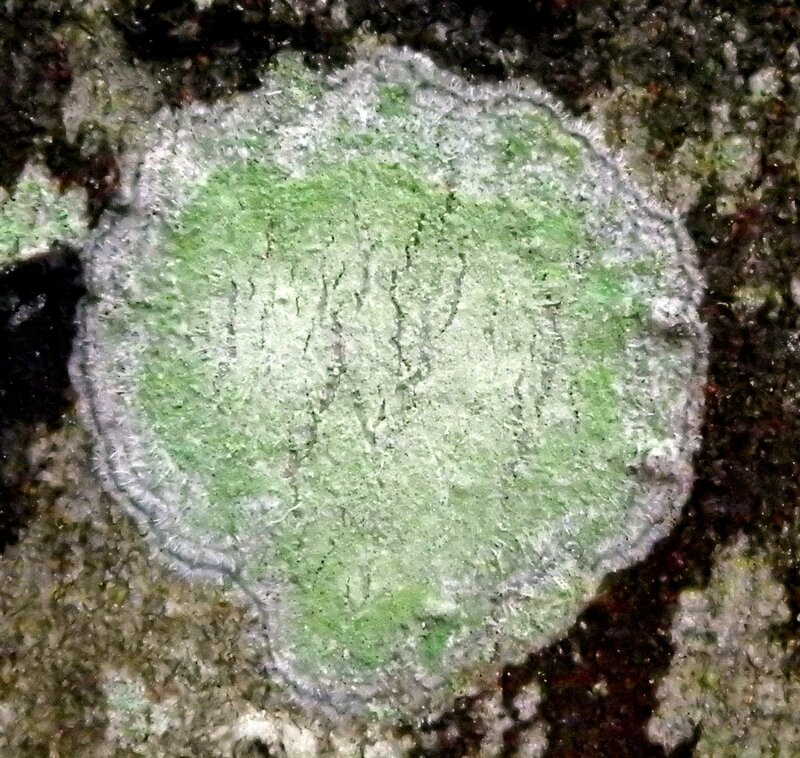 Powdery sunburst lichen (Xanthomendoza ulophyllodes) was growing on a stone. 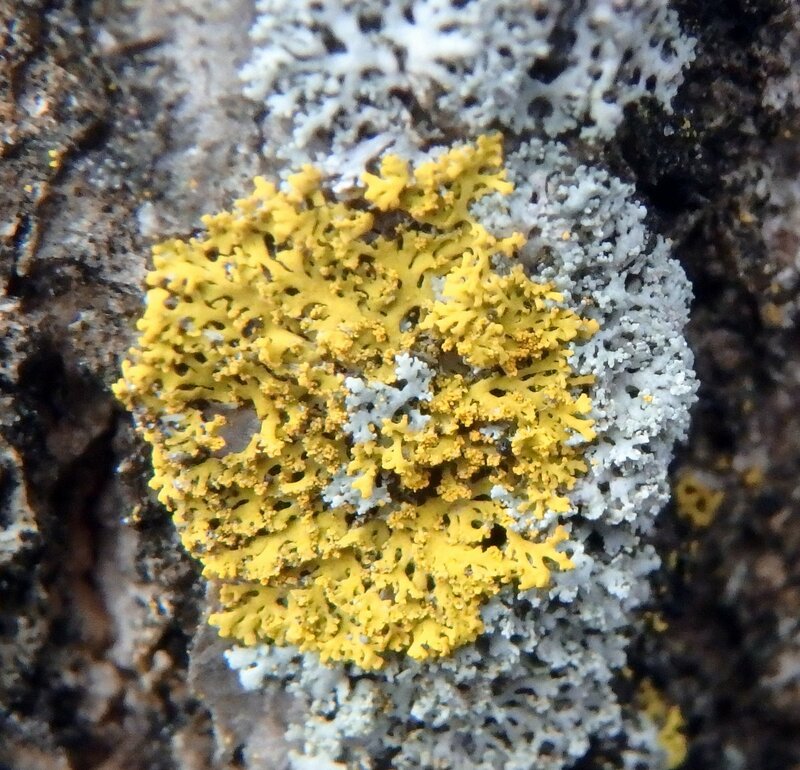 This foliose lichen is easy to see, even when it’s small, because of its bright orange yellow color. 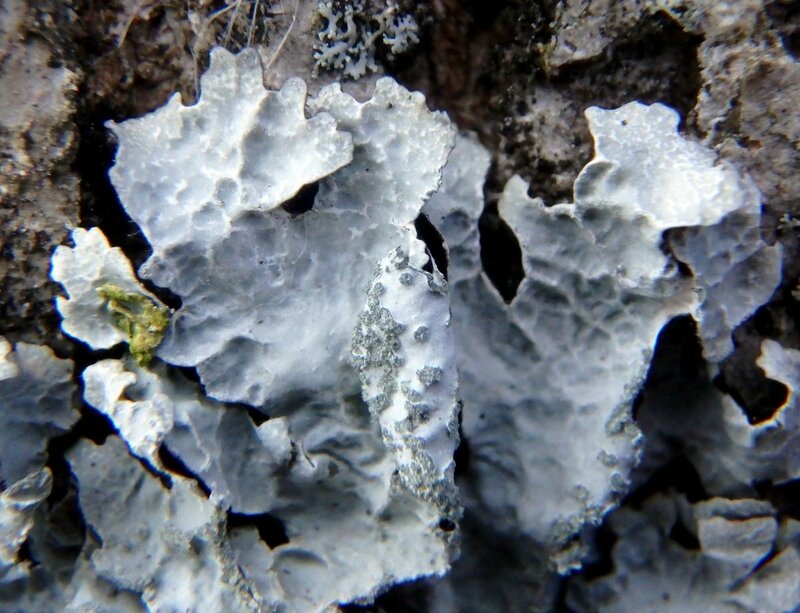 This lichen really likes moisture and is often found growing near channels that carry water on stone or bark. This one was about the size of an average aspirin. 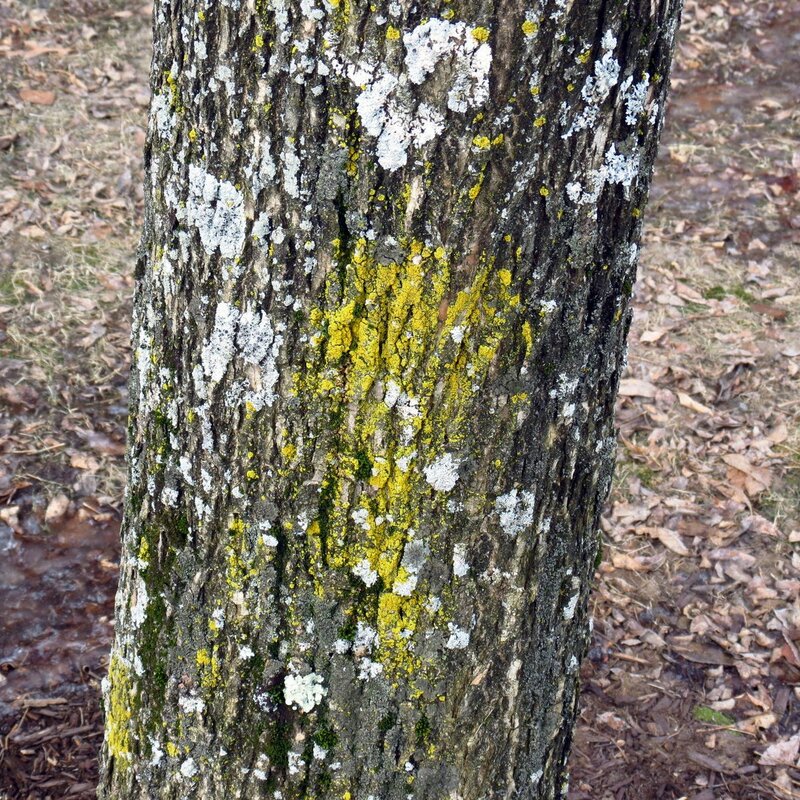 Lichens are a good indicator of air quality, so if you aren’t seeing them you might want to check into your local air quality. Lichens like the common goldspeck lichen (Candelariella vitellina) in the above photo are here year round for us to enjoy, and once the leaves fall many lichens become even easier to see. 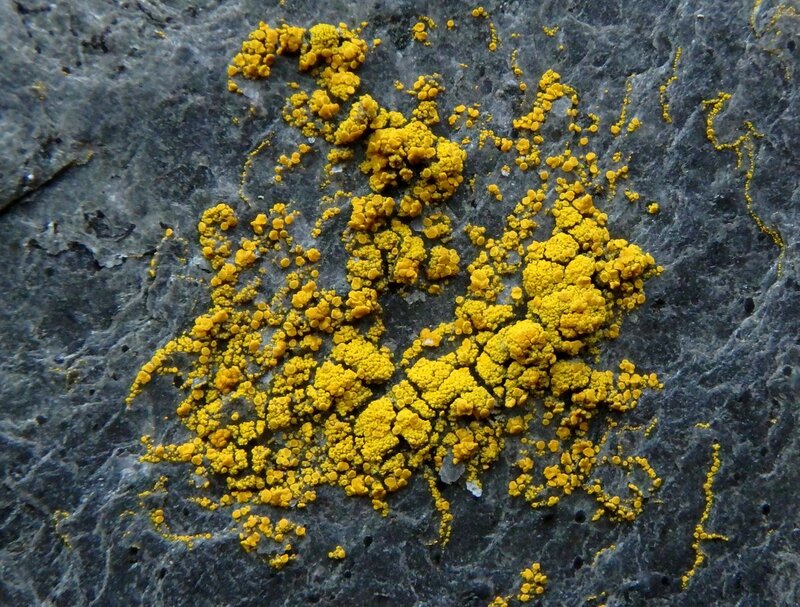 Look for this bright yellow crustose lichen on stone. 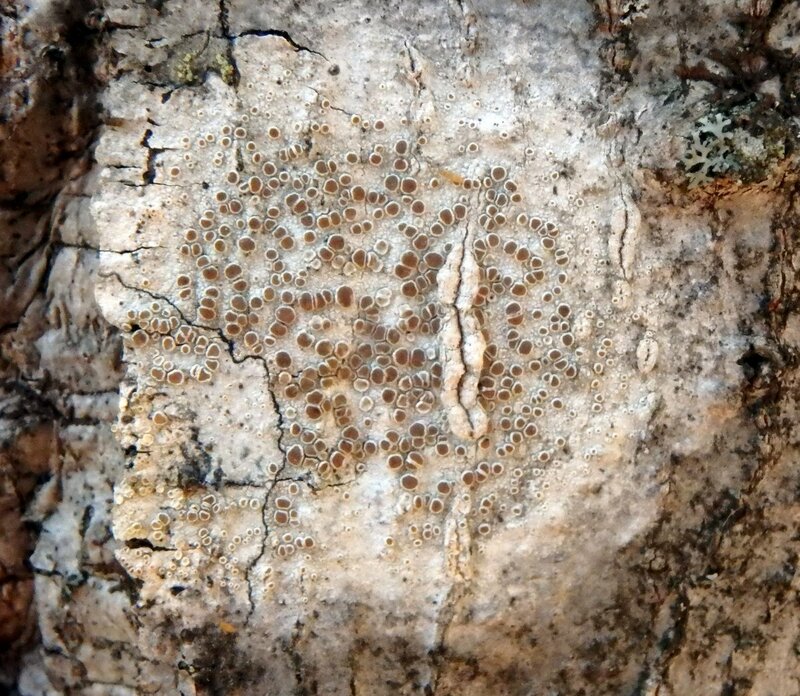 Crustose lichens form crusts that tightly adhere to the substrate that they grow on and usually can’t be removed without damaging it. 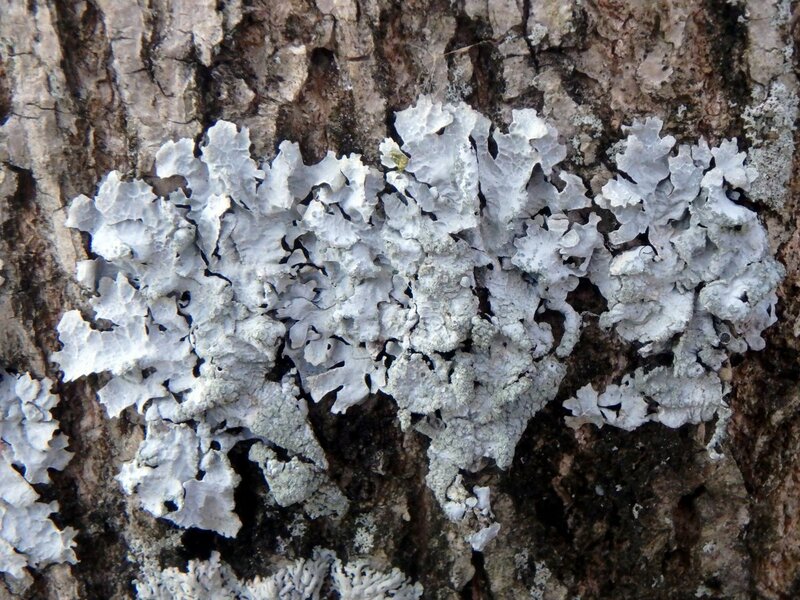 As its name implies maple dust lichen (Lecanora thysanophora) grows on the bark of maple trees, but also on beech, oak, and basswood. 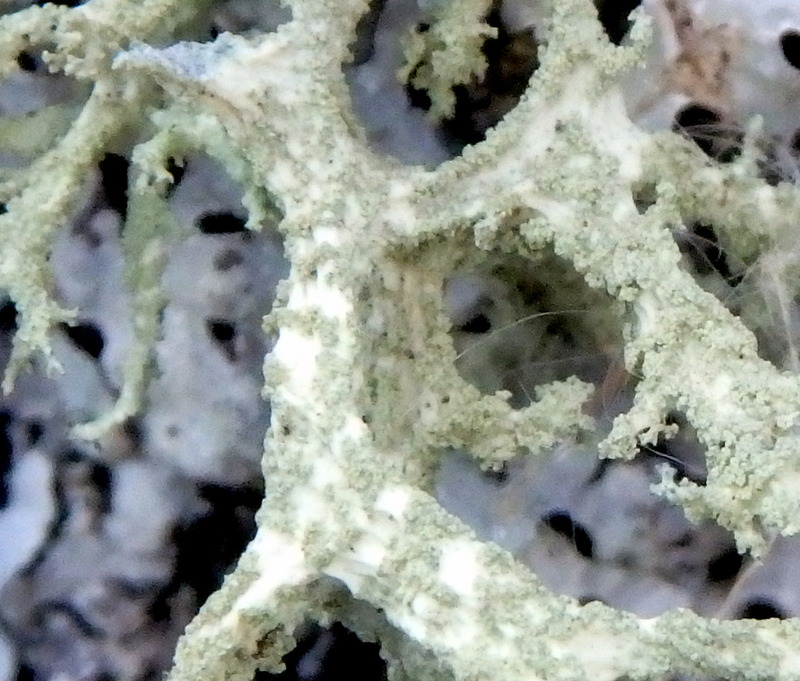 One of the easiest ways to identify this lichen is to look for the white fringe around its perimeter. This is one of those lichens that I never saw until I stumbled across it one day, and now I see it everywhere. This example was about 3/4 of an inch in diameter, or about the size of a penny. Cumberland rock shield lichen (Xanthoparmelia cumberlandia) likes to grow on boulders and that’s where I found this one. 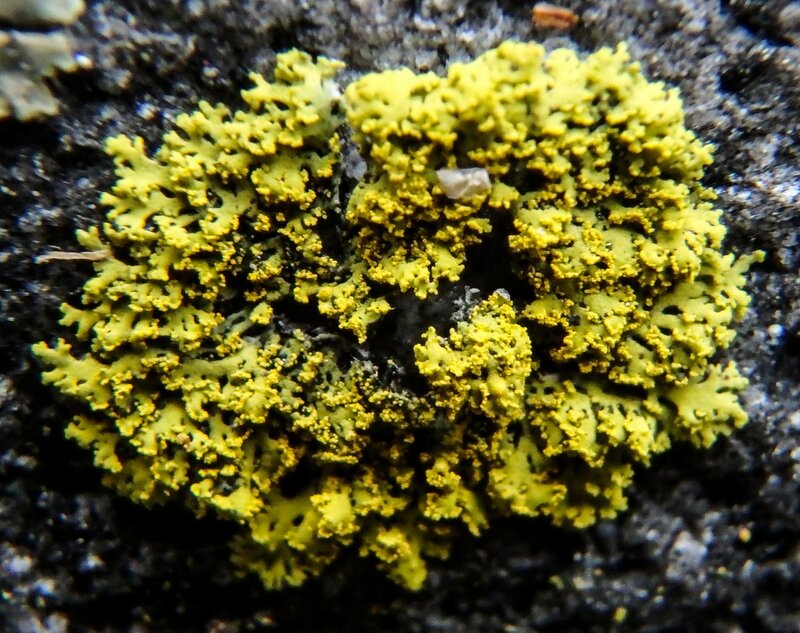 The body (Thallus) is described as being “yellow-green to sometimes bluish green” and the fruiting discs (Apothecia) are “cinnamon to dark brown.” The body of this lichen always looks like someone dripped candle wax on the stone to me. 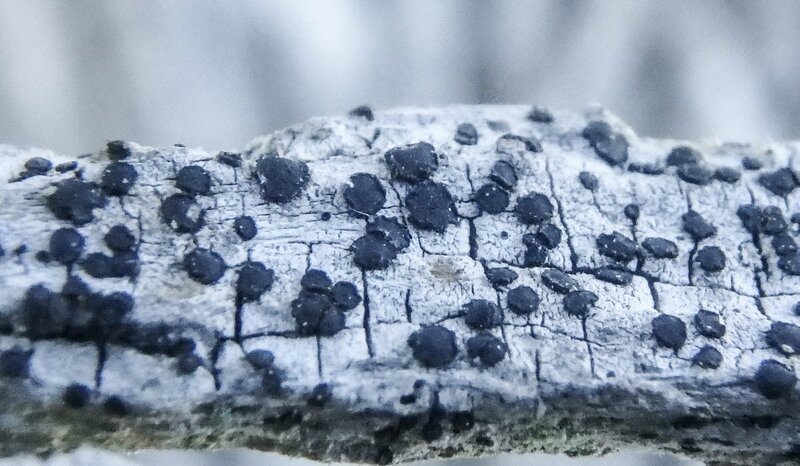 This is a close up of the apothecia on a Cumberland rock shield lichen. 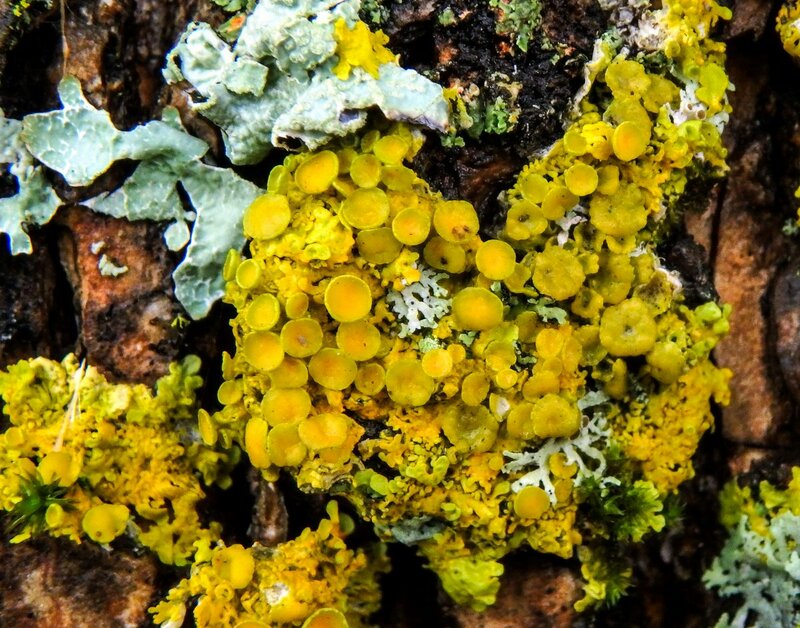 Lichens are made up of a symbiotic relationship between fungi and algae or cyanobacteria. Technically apothecia are “fungal reproductive structures, in which the fungus reproduces itself through the production of spores” This is not the only way that lichens reproduce, but it is common and the apothecia are often beautiful and well worth watching for. Beard lichens are common enough; they even fall from the trees on windy days, but this beard lichen is growing on stone and that’s very uncommon, in my experience. 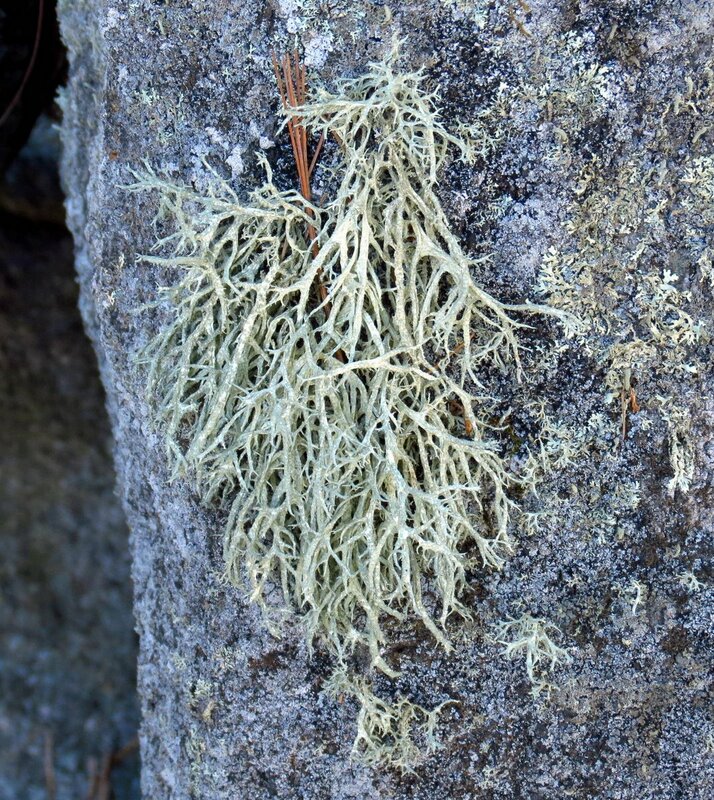 I think this example must be bristly beard lichen (Usnea hirta,) which can grow on wood or stone, but I must see a hundred growing on wood for each one growing on stone. 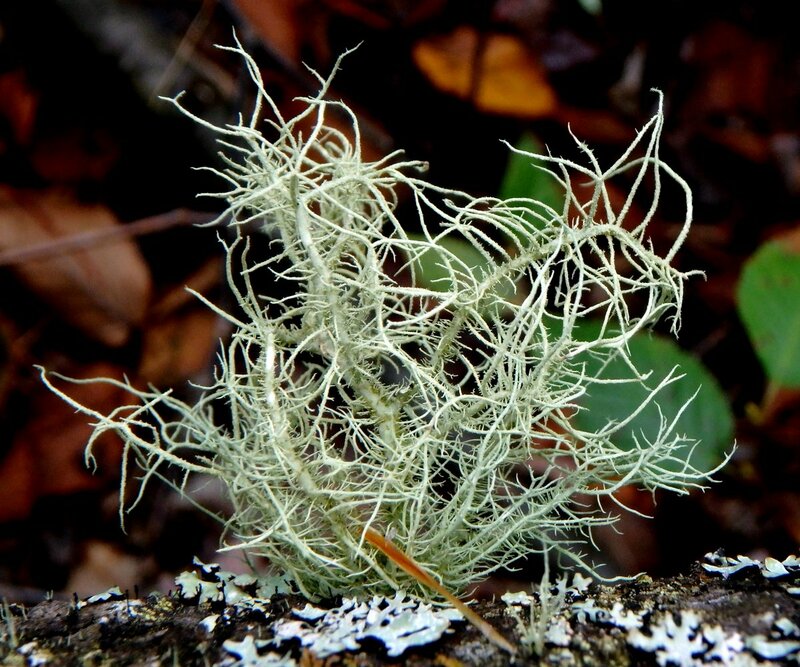 There are many different kinds of beard lichens and the differences can be subtle, but the fishbone beard lichen (Usnea filipendula) stands apart because of its resemblance to the backbone of a fish. 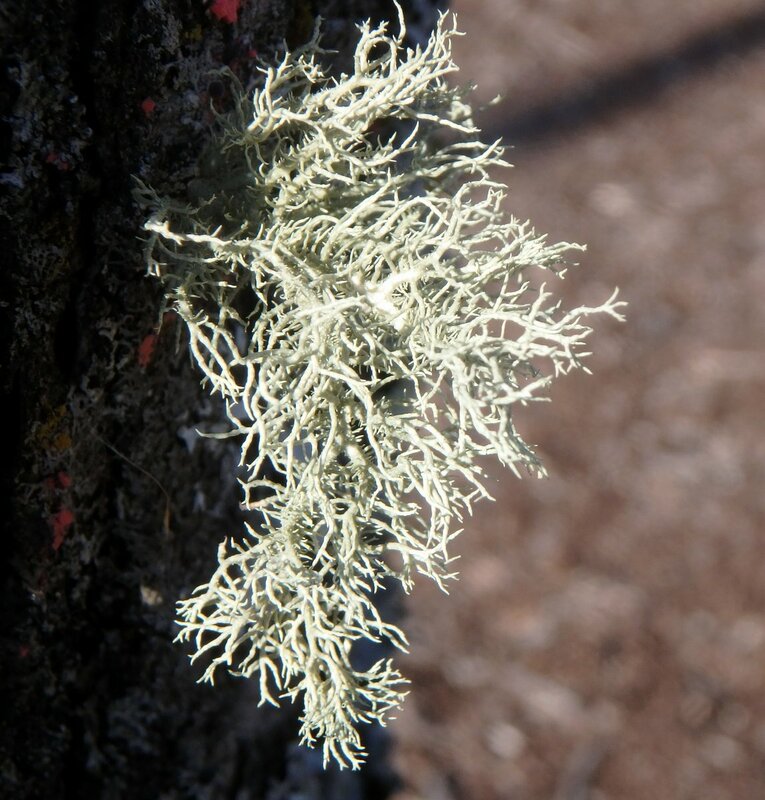 This lichen seems to prefer growing on spruce but I’ve seen it on other trees as well. Though it isn’t rare I don’t see it often. 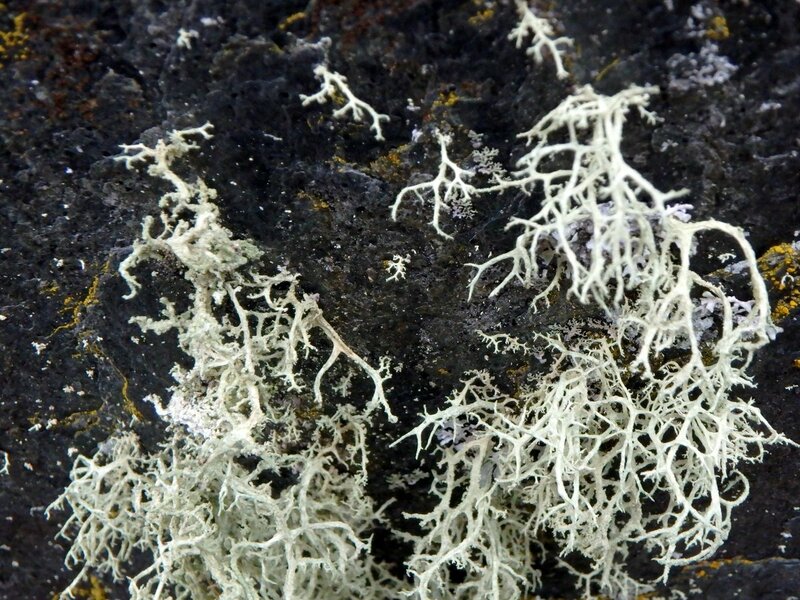 Lichens in the Usnea genus contain usnic acid and have antiseptic / antibiotic properties. They have been used since ancient times throughout the world to heal wounds. 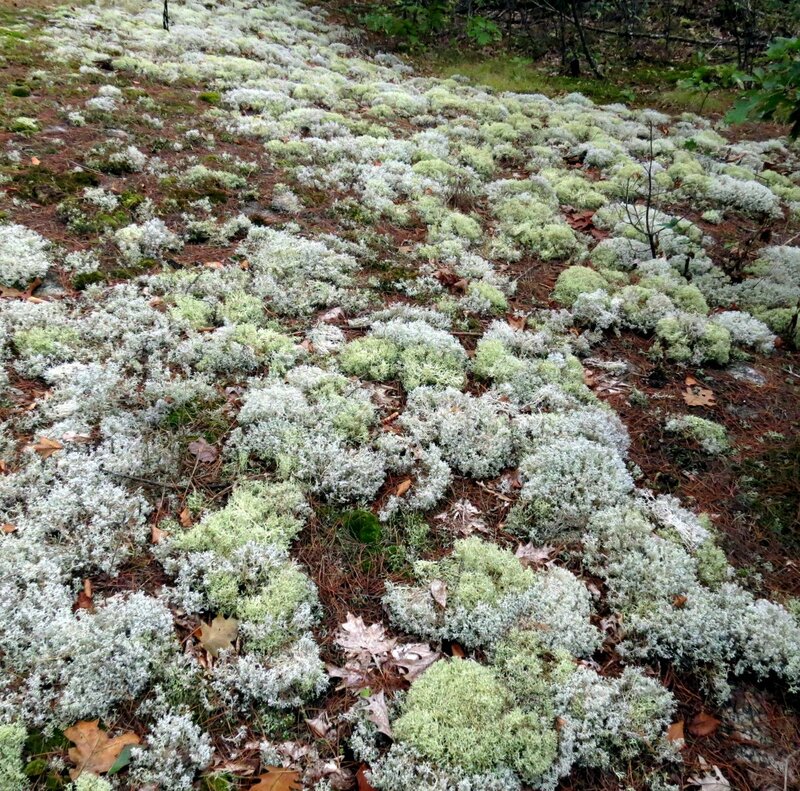 Gray reindeer lichen in this area is silver gray, almost white, with a main stem and branches much like a tiny tree. 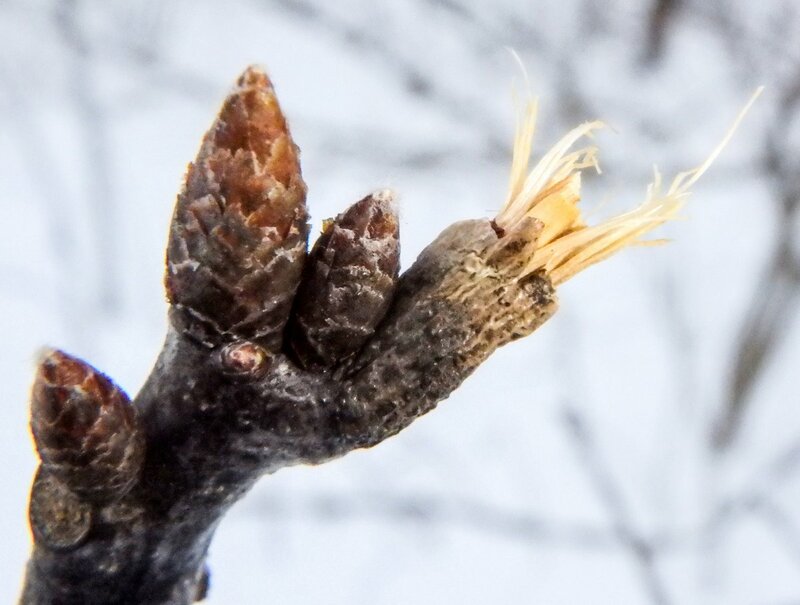 Each branch tip is a brownish color with a globe or pear shaped fruiting body called a pycnidium. 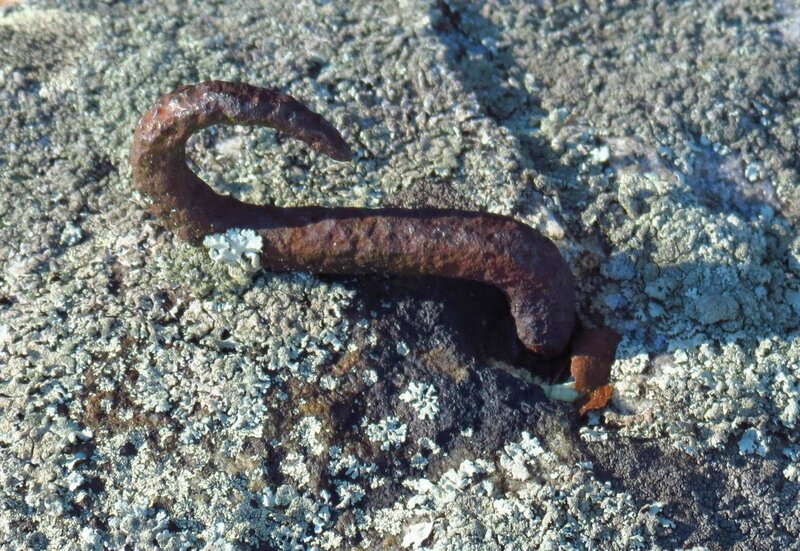 The Native American Ojibwa tribe were known to bathe newborns in water in which this lichen had been boiled, and other tribes drank tea made from it. 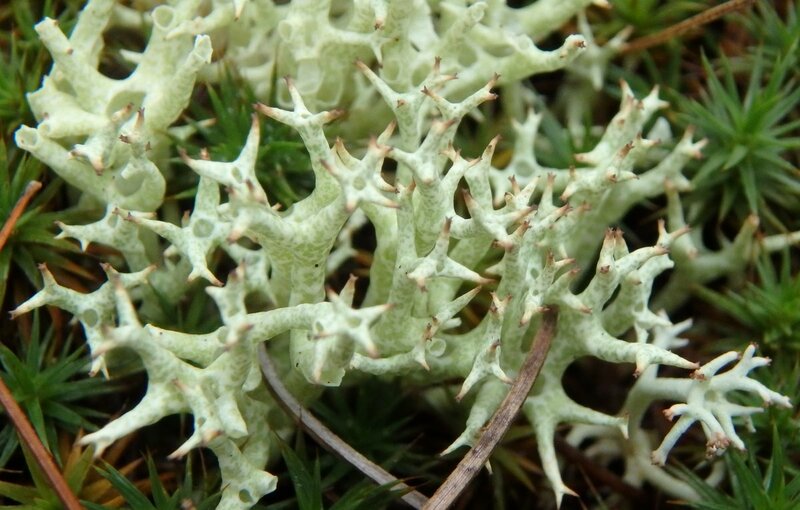 It has also been eaten, but if you plan on eating lichens correct preparation is everything, because some can cause serious stomach problems. 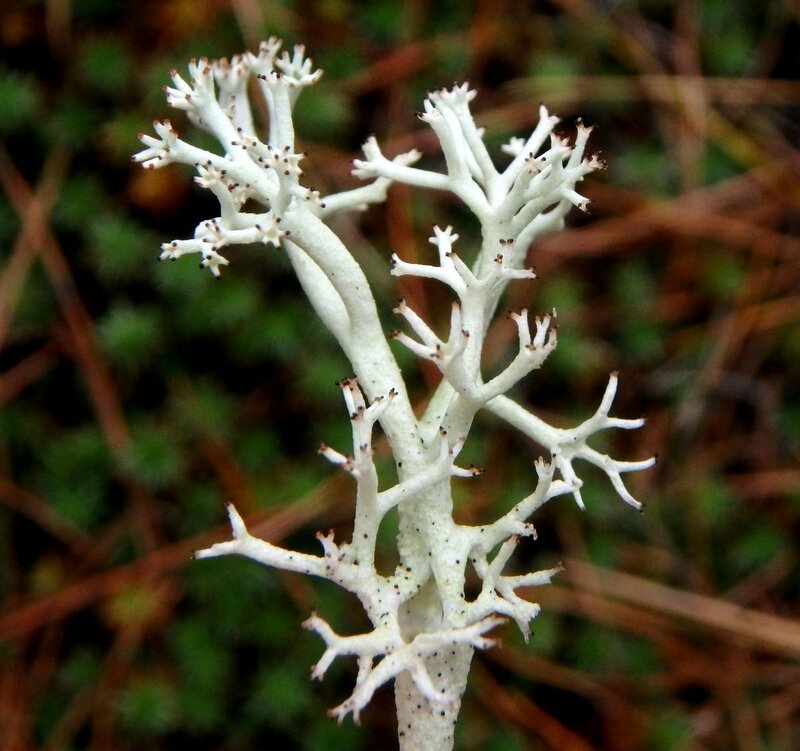 It’s easy to see how star tipped reindeer lichen comes by its common name; each branch tip ends in a star shaped cluster of four or five branches surrounding a center hole. 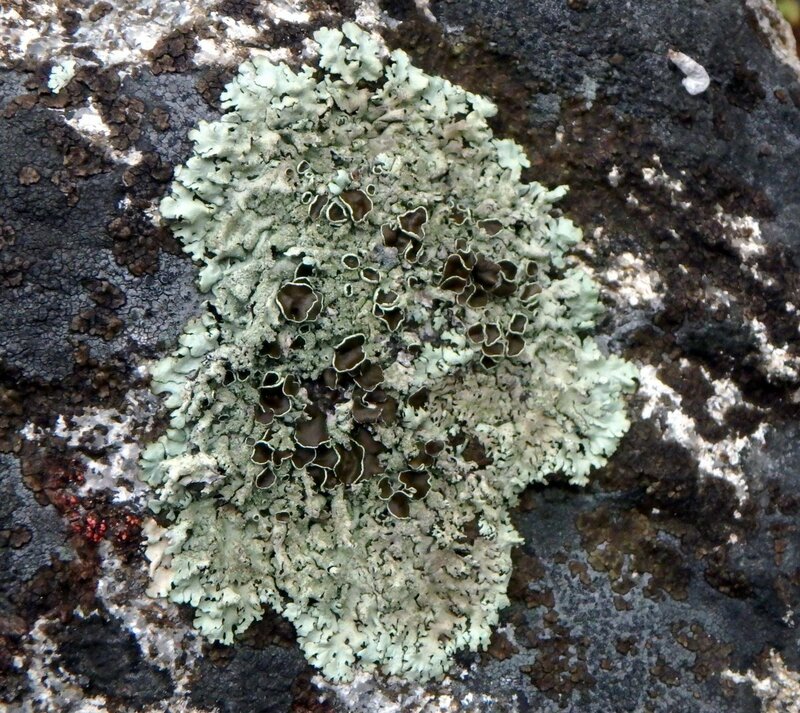 This lichen seems to be a favorite of reindeer; they will often leave the gray reindeer lichen until last and eat this one first. 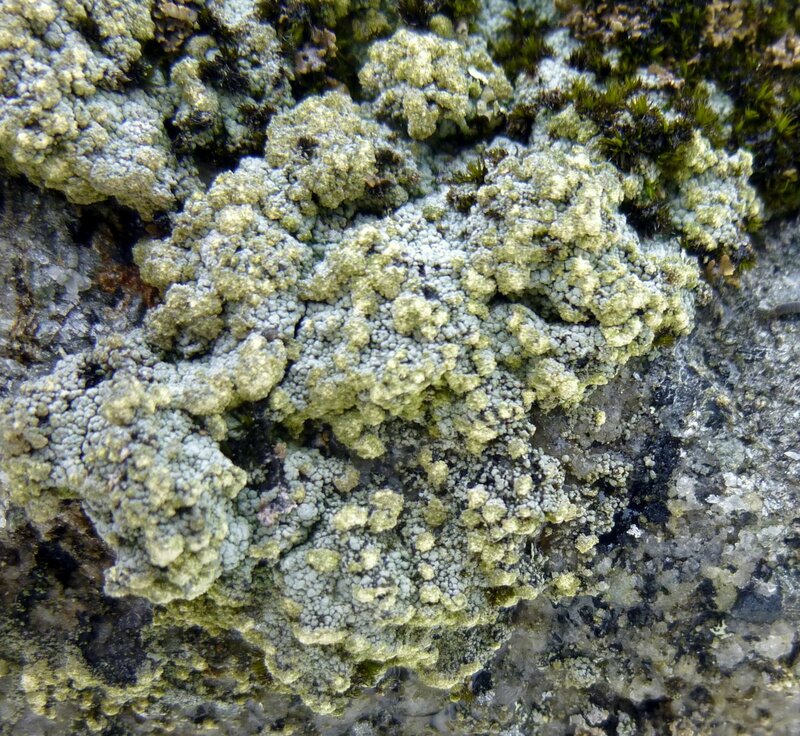 In Europe this lichen is used in the pharmaceutical industry as an ingredient in antibiotic ointments. One of the most beautiful lichens that I find growing on stone is the smoky eye boulder lichen (Porpidia albocaerulescens) with its blue apothecia. The blue color seen in the above photo is caused by the way light reflects off a waxy coating on the fruiting bodies, which is very similar to the “bloom” found on plums, blueberries, and grapes. It’s as if pieces of the sky had been sprinkled on the stones when the light is right, but the apothecia can also appear black or gray depending on which direction the light happens to be coming from. 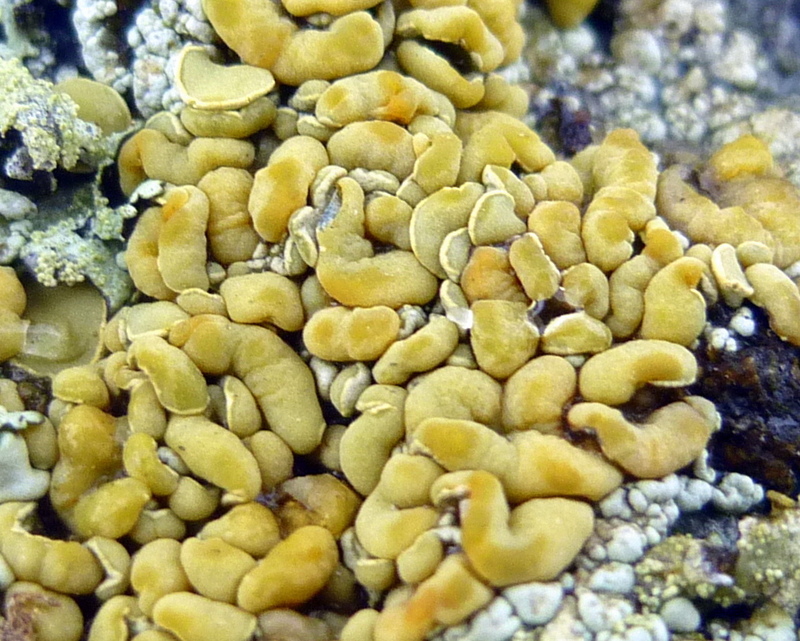 The greenish-gold background color is the color of the body (thallus) of this crustose lichen. 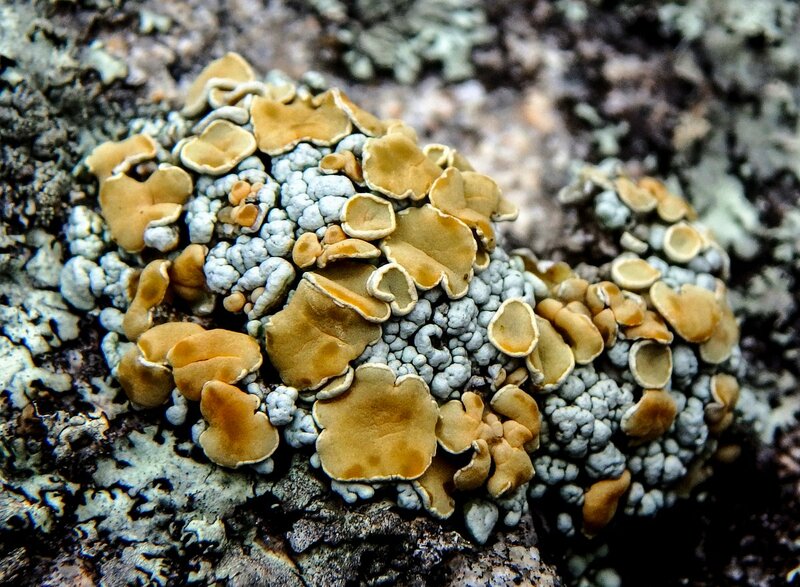 I hope this post has shown how beautiful and interesting lichens are, and how easy they are to find. Lichens grow virtually everywhere including on building facades, sidewalks and rooftops, so they can even be found in cities. 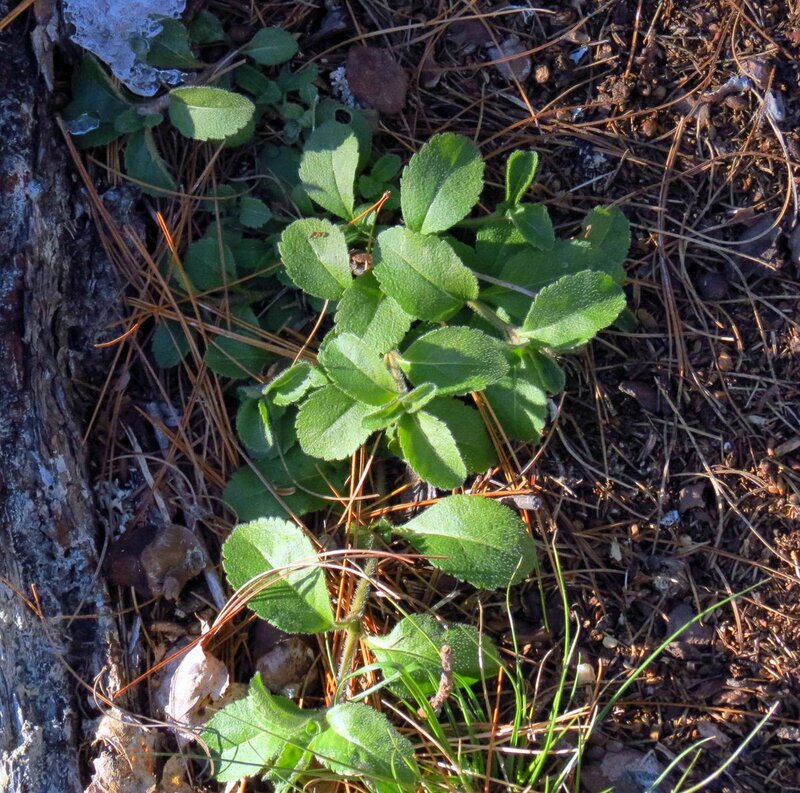 Many are quite small though, so you have to walk slowly and look closely to find them. Once you’ve seen a few you’ll start seeing them almost everywhere you go. 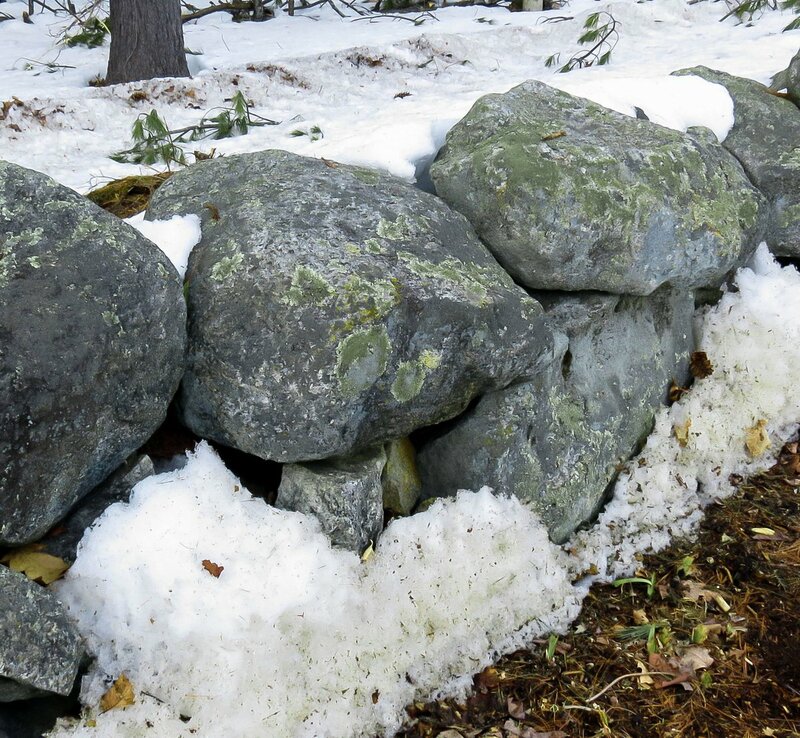 We’ve had some warm weather here and that means that the snow is melting away from the stone walls. Since there are many miniature gardens growing on these old walls I thought I’d have a look. Right off I was drawn to a boulder with patches of bright orange all over it. They turned out to be scattered rock posy lichens (Rhizoplaca subdiscrepans); more than I had ever seen in a single grouping. 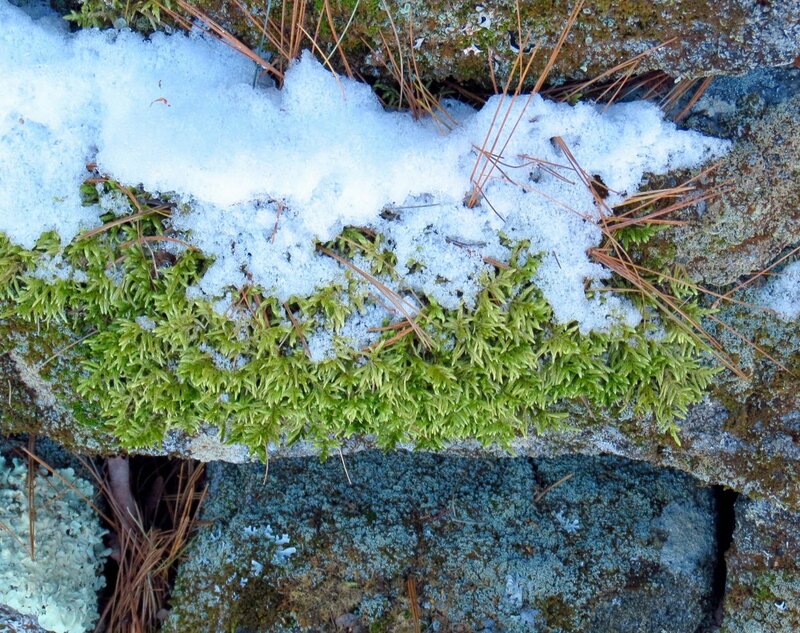 The white pine needles in this shot will give you an idea of just how small these lichens are. 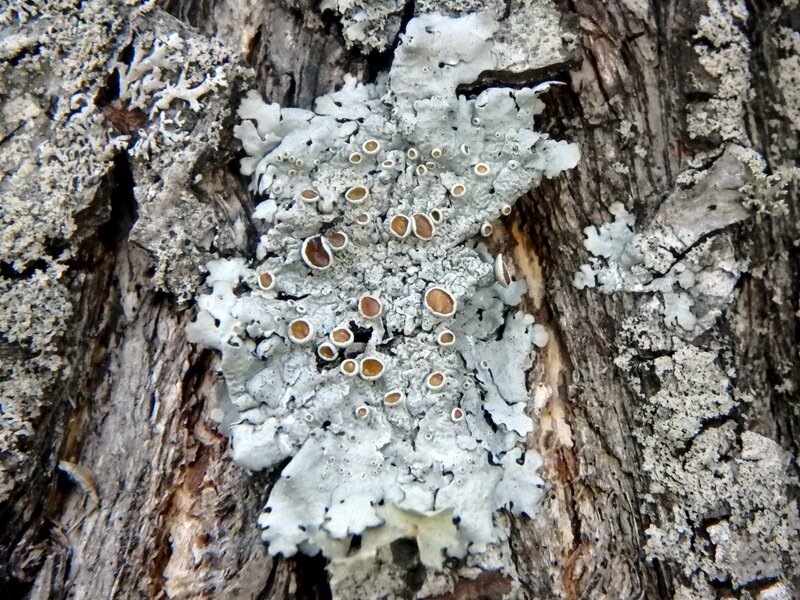 Observing the small size of lichens is a good way to get used to seeing the small and beautiful things in nature. If you want to see the magic in nature sometimes you have to stretch some, and that includes your eyes, so each year at about this time I start looking closely at lichens to get my eyes and mind back into “small mode.” I practice on lichens in the early spring so I don’t miss the tiny flowers, insects, fungi, slime molds, and other fascinating things that will come later on. The fruiting bodies (apothecia) of these scattered rock posy lichens surprised me by looking like a mass of orange sausages. Usually they are flat and disc shaped like the one in the upper left corner of this photo, and I’m assuming that this is what they look like before they take on the disc shape. Each disc shaped apothecia is about .04 inches (1mm) across. If you’re interested in seeing small things in nature and have a ruler handy, you might want to look at it now so you can become familiar with just how small 1 millimeter really is. Finding things that size on a rock or tree can be a challenge, and that’s why I have to retrain my eyes to see them each spring. It isn’t just the eyes though; it’s also knowing where to look and knowing how to “think small,” but they come with experience. Lichen identification can be tricky. I found what I believe is a rosy saucer lichen (Ochrolechia trochophora) growing on stone but the book Lichens of North America says that this lichen grows on tree bark. 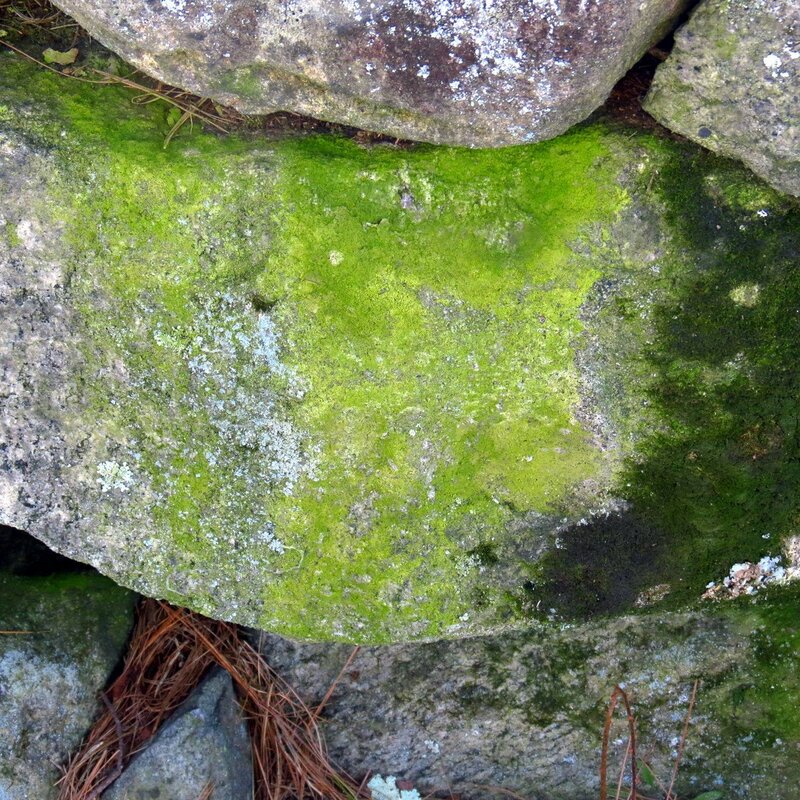 A little further research on the website Images of British Lichens shows that it grows on tree bark or stone. 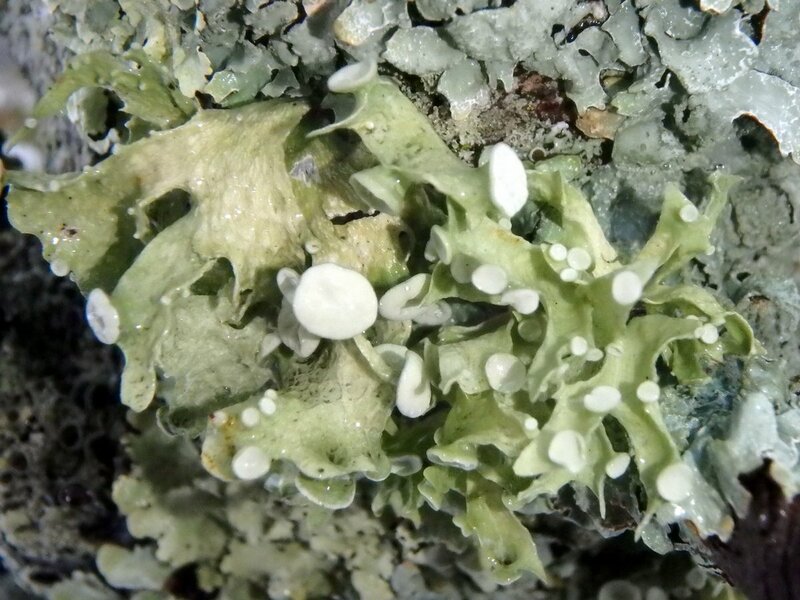 Based on that information and the fact that I can’t find a similar saucer lichen that grows in New England, I’m going with rosy saucer lichen. 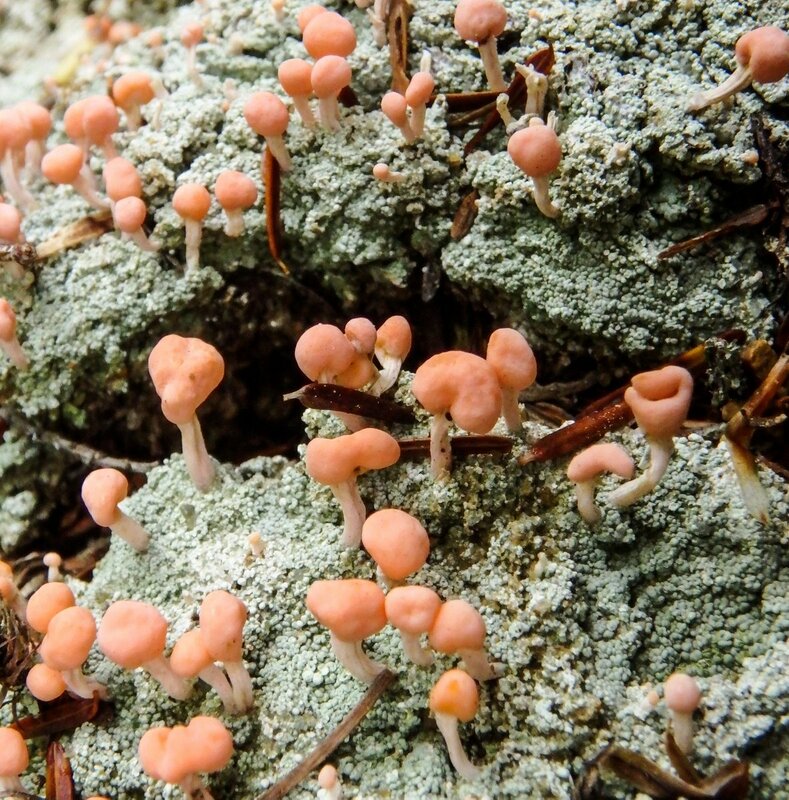 Even though it has rosy in its name its apothecia can range from pink to orange, according to what I’ve read. I’m not sure how fast Cumberland rock shield lichens (Xanthoparmelia cumberlandia) grow but any lichen this big has to be very old. It must have been 10 inches across and there were several others that big nearby, so I think it’s safe to assume that these stones haven’t been disturbed in quite a long time. They were fruiting so they must be happy here. 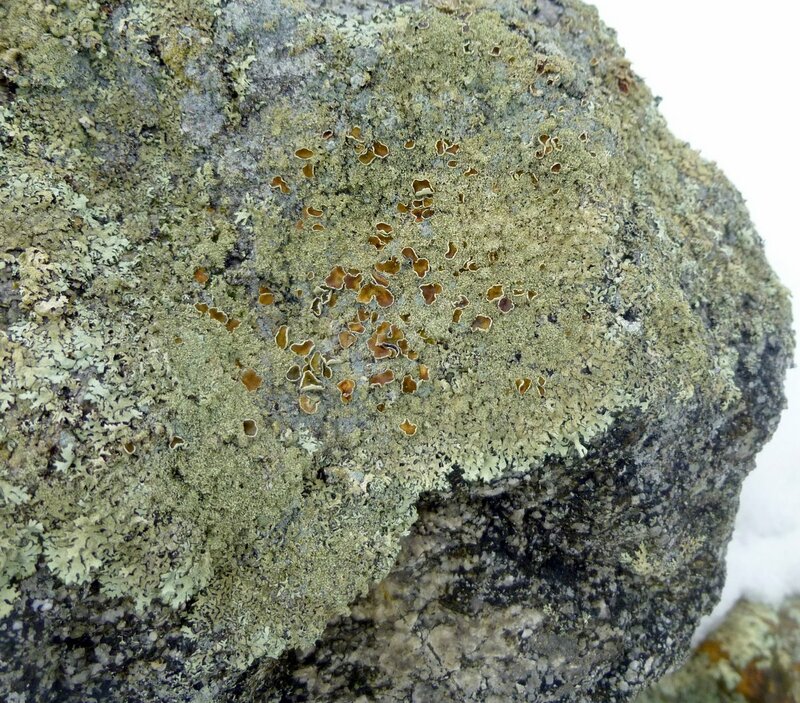 Note: Canadian biologist Arold Lavoie has identified this lichen as a peppered rock shield (Xanthoparmelia conspersa). 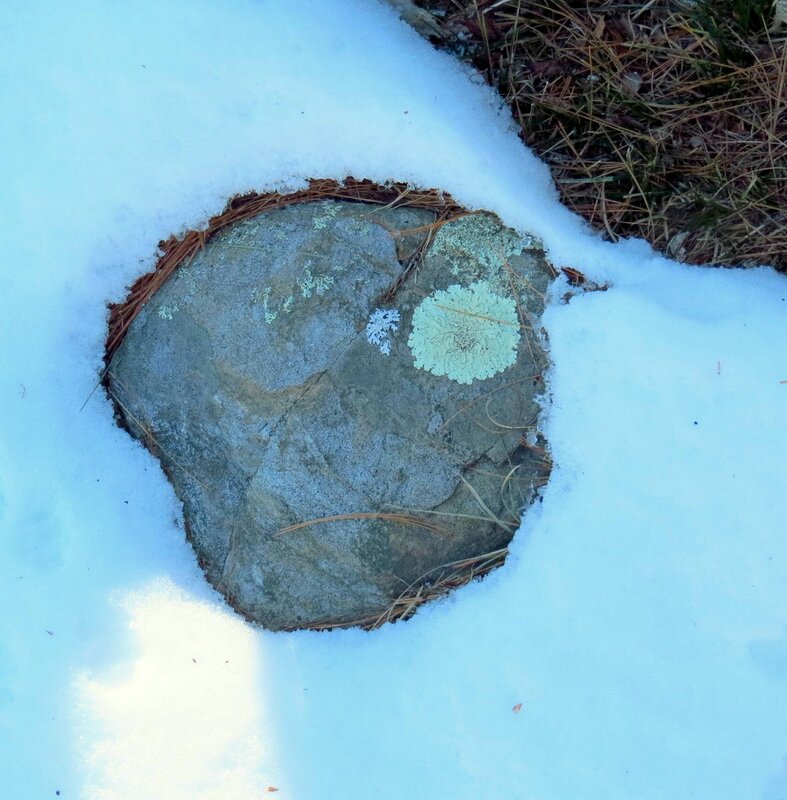 Arold pointed out that Cumberland rock shield doesn’t have any of the granular vegetative reproductive structures called isidium that can be seen on this lichen. Thanks very much for the help Arold. 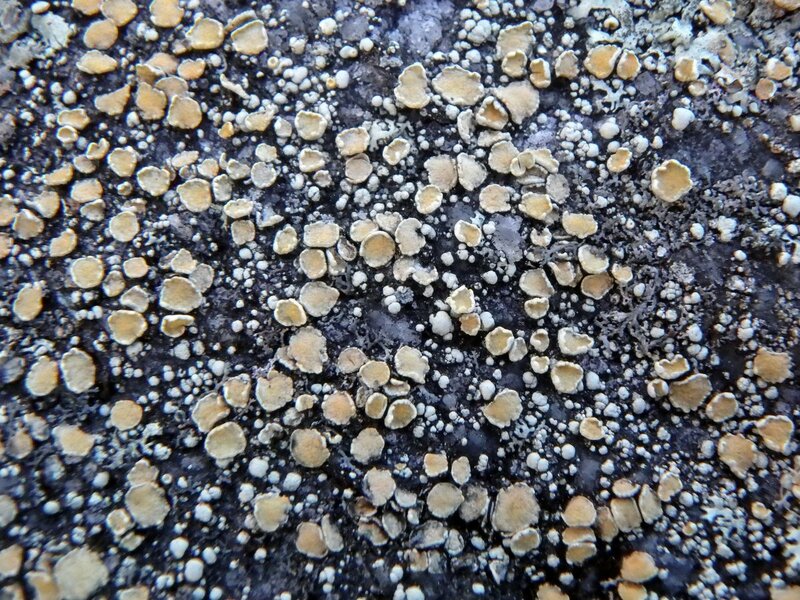 This is a closer look at the fruiting bodies (apothecia) of the peppered rock shield lichen. They are fairly common and always seem to be folded or deformed looking. They are also always orangey-brown or dark brown in color. I used to just pass by things that looked like white or gray crust on stones, but I stop and look a little closer now after finding things like this crater lichen (Diploschistes diacapsis). 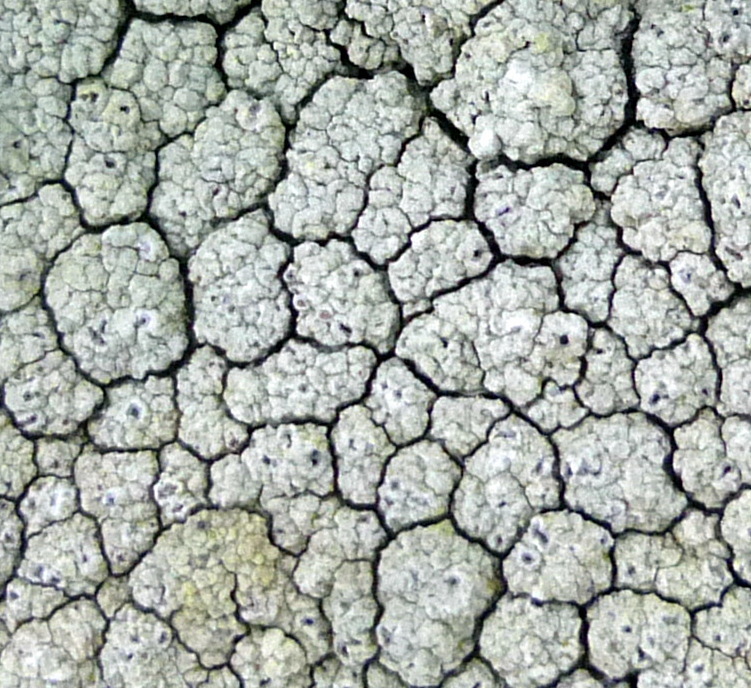 The lighter parts of this lichen make up its thick body (thallus) and the dark spots are its fruiting bodies (apothecia). 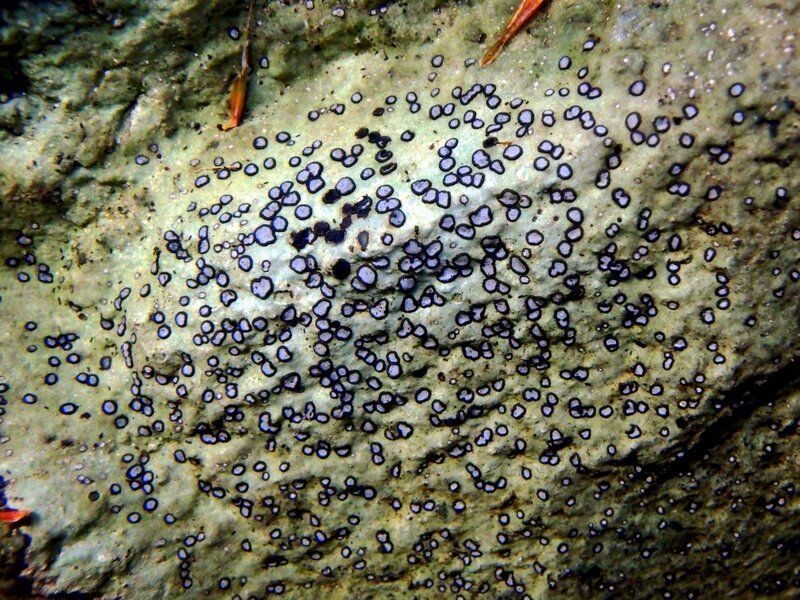 Its common name comes from the way the apothecia sink into the thallus and look like tiny craters. 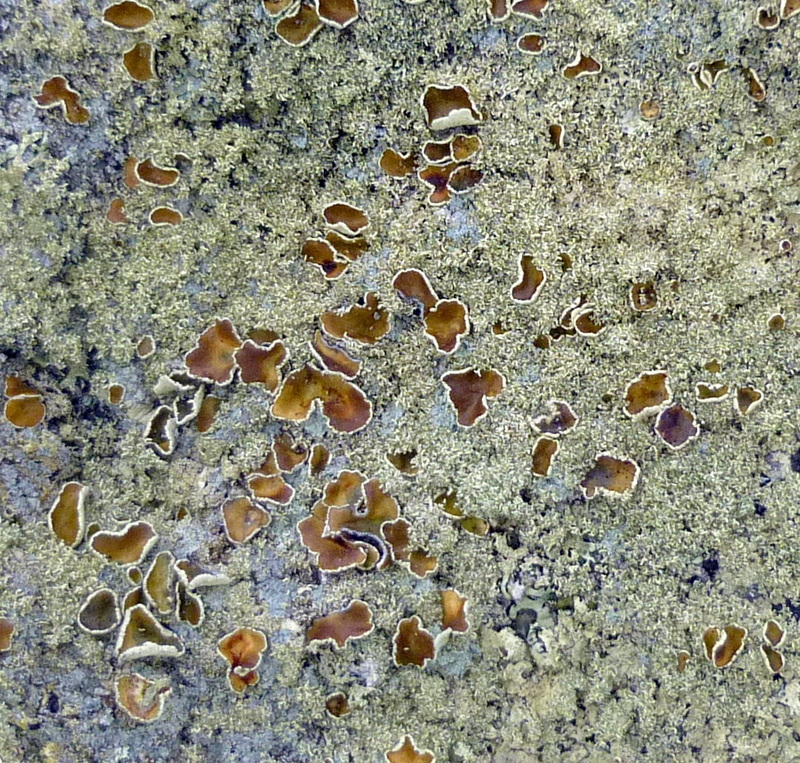 Crater lichens prefer growing on calcareous stone and are a good indicator of limestone in the area. 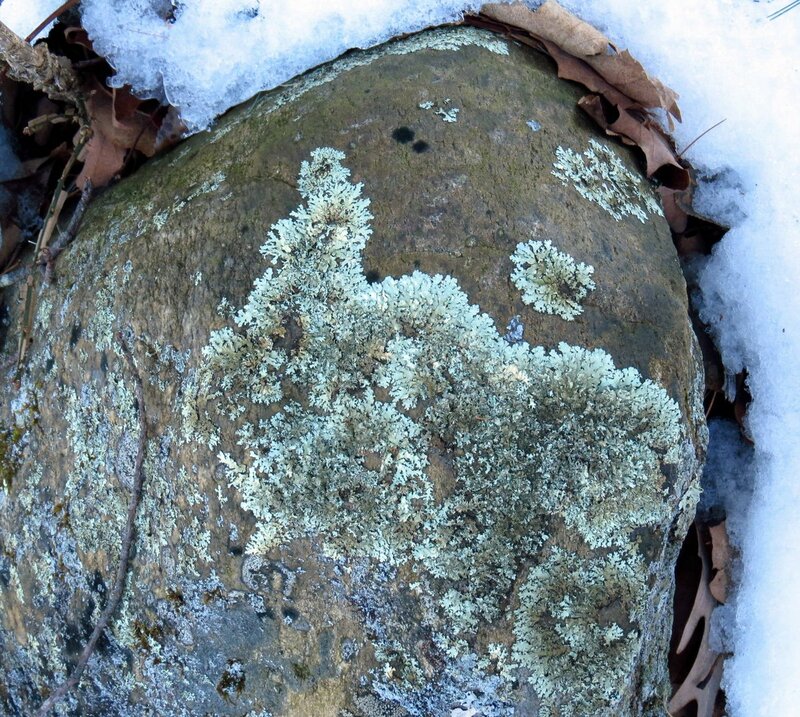 If you’re trying to find orchids or other plants that like lime laced soil, finding this lichen on the stones in the area you’re searching might lead you to them. 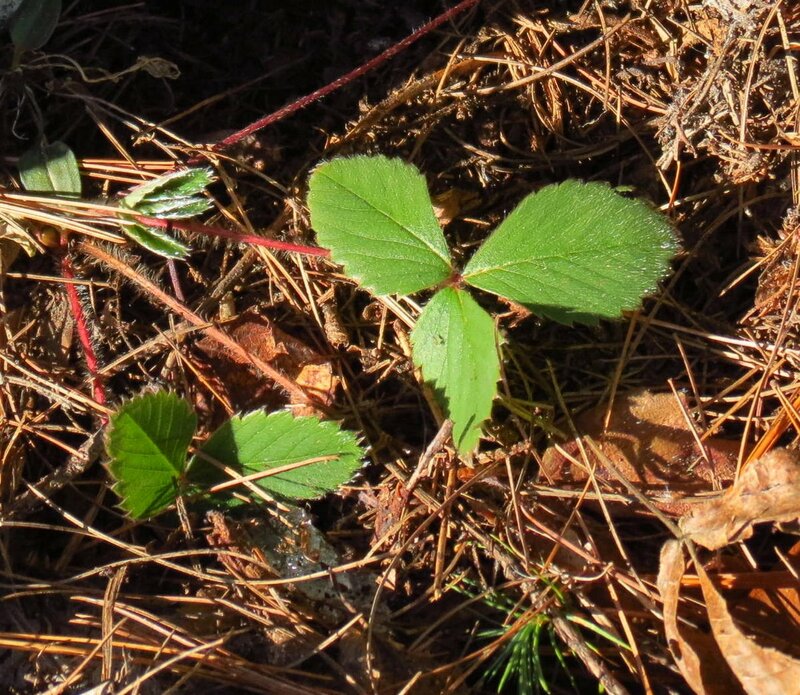 I’ll be watching for it later on when I search for hepatica and spicebush. 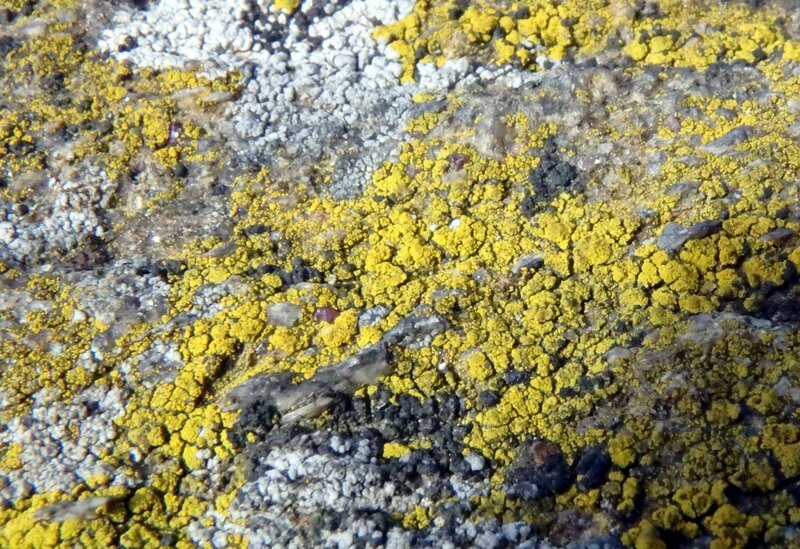 Mealy firedot lichen (Caloplaca citrina) is a pretty little yellow to yellow-orange crustose lichen that likes to grow on wood or stone. 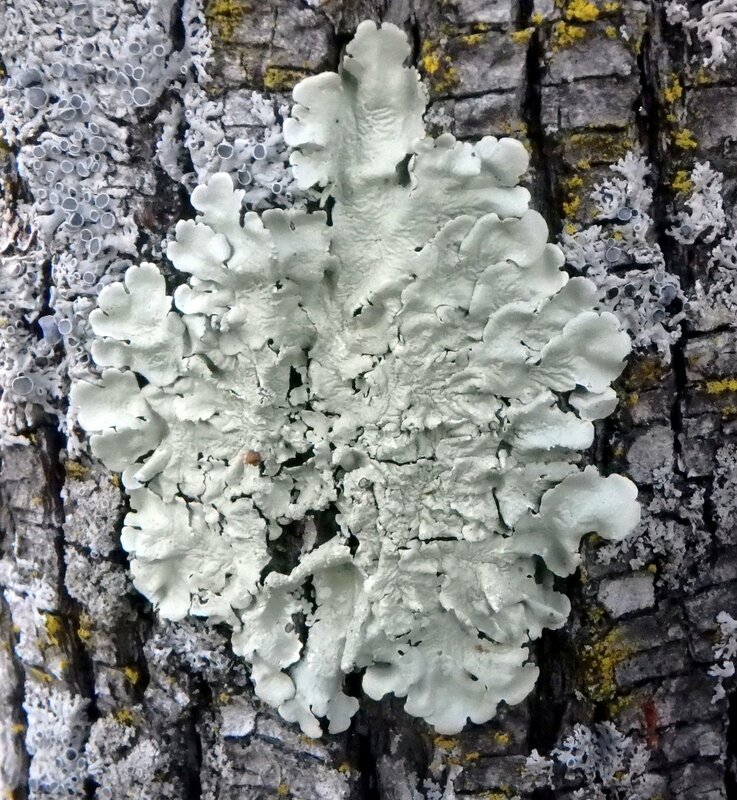 The book Lichens of North America says that it is a very common lichen that rarely produces spores but this example seemed to be fruiting happily. The mealy part of its common name comes from the numerous granular soralia, which are used as a vegetative means of reproduction. 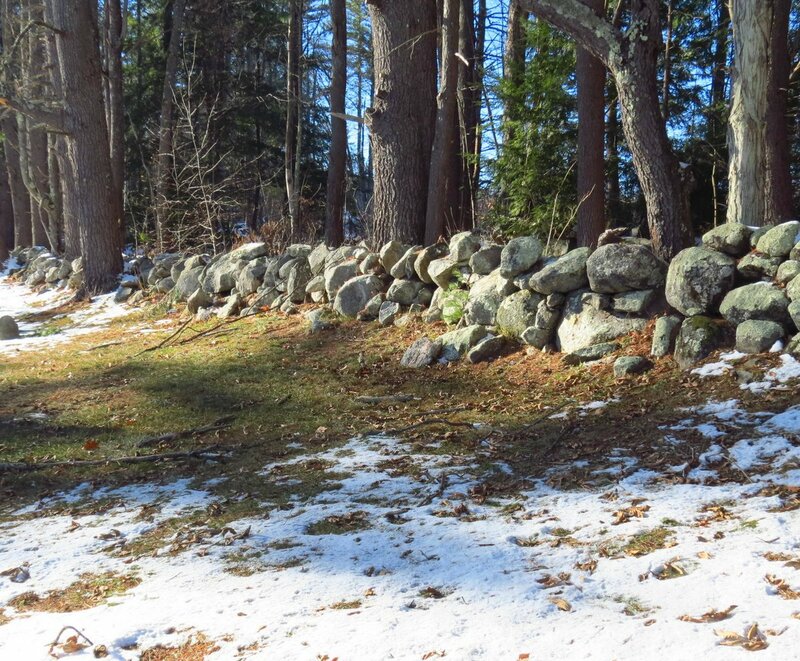 They are meant to break off and start new lichens. 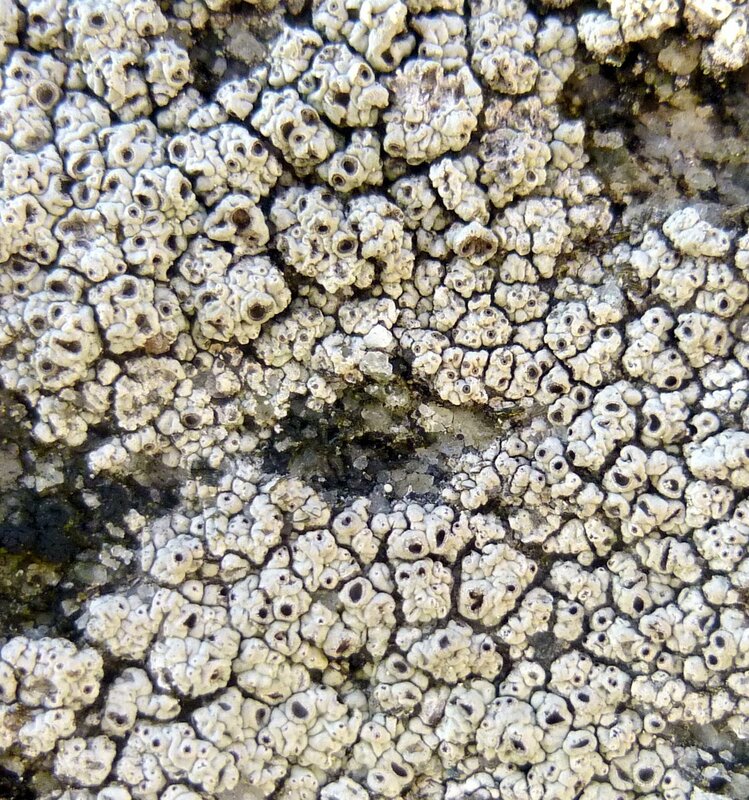 It could be that because mealy firedot lichens reproduce vegetatively they don’t feel the need to use energy in spore production but as this closeup view shows, this example was doing both. The tiny round objects that look like the suckers on an octopus are its fruiting bodies (apothecia). The shiny background in these photos happened because the stone was wet, so this lichen was getting plenty of water. 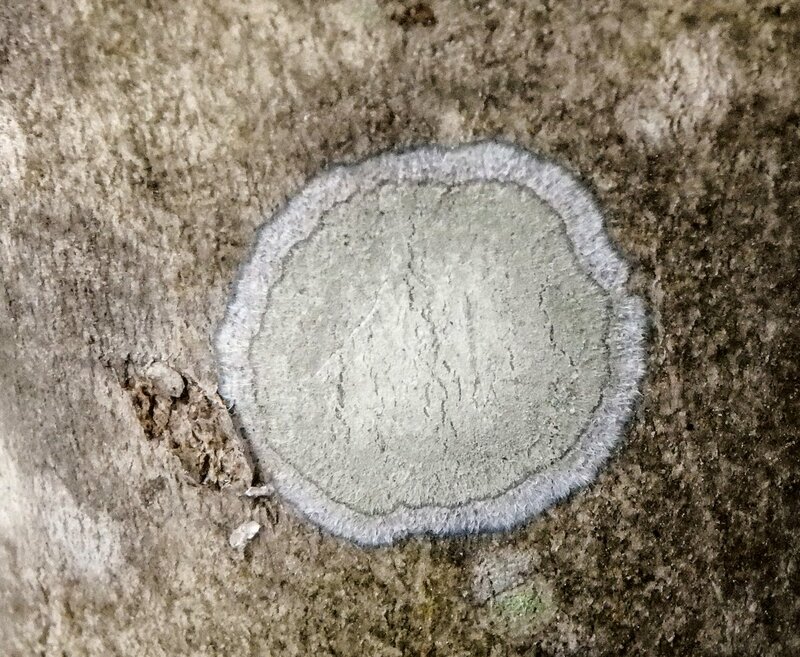 This is another kind of ‘ho hum’ white crusty lichen that doesn’t look very interesting until you get out your loupe or train your macro lens on it. The ‘boring’ lichens have taught me that if something in nature doesn’t look worth bothering with it was only because I wasn’t really looking at it, because there isn’t a single piece of nature that isn’t beautiful or fascinating in some way. 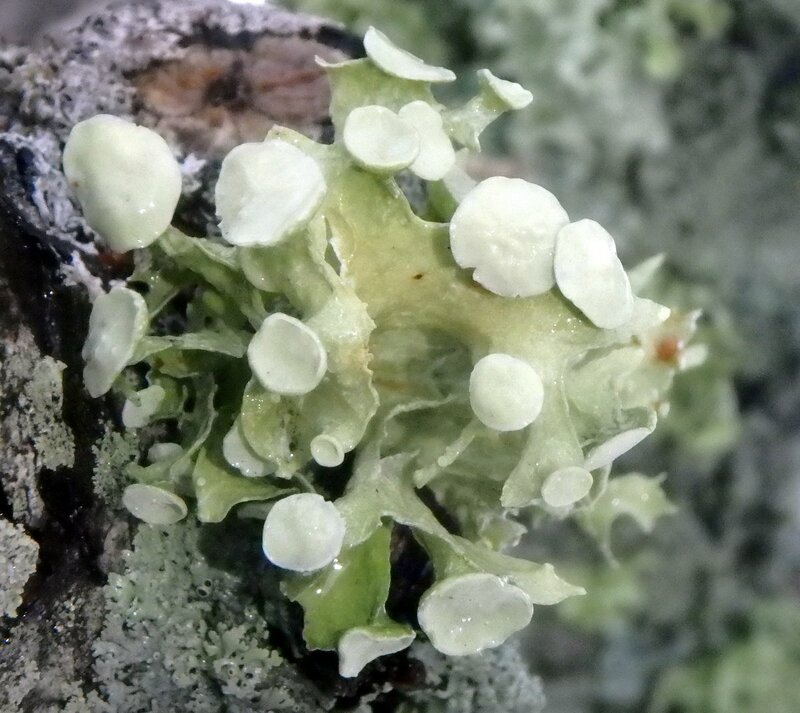 The fruiting bodies of this contorted rimmed lichen (Aspicilia contorta) were as tiny as a pencil dot on a piece of paper but they were there, and I’ve walked by them hundreds of times without stopping to see them. Finally noticing them wasn’t a life changing experience but such an alien landscape is very beautiful to me and I understand a little more about lichens than I did previously. Observing the beauty of nature and gaining knowledge are never a waste of time. It seems that every time I do a post on lichens I have one or two that have me completely stumped, and this is today’s winner. 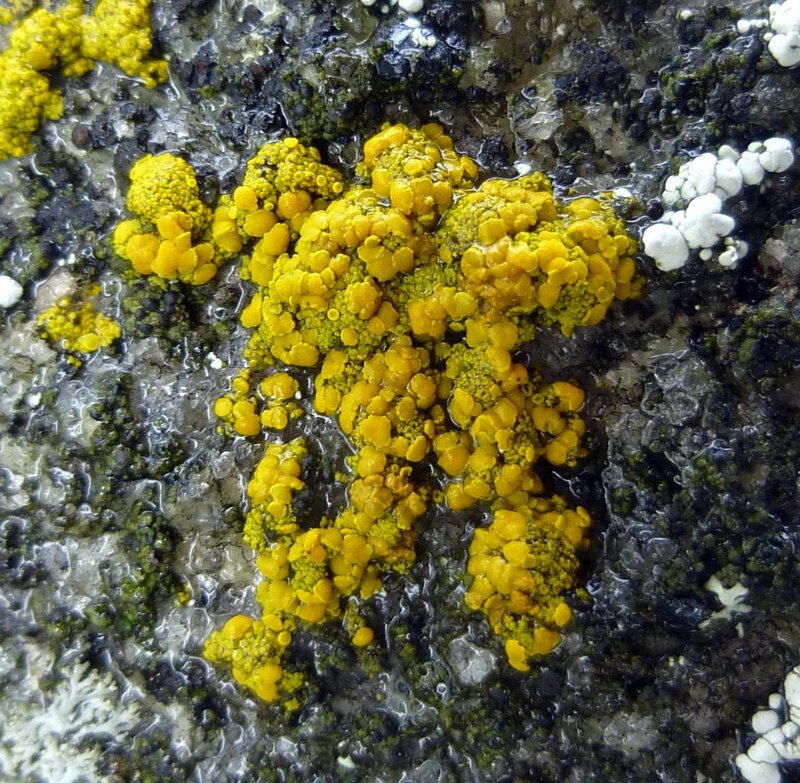 Beyond knowing that it is a gray and yellow crustose lichen that was growing on granite, I know nothing about it. 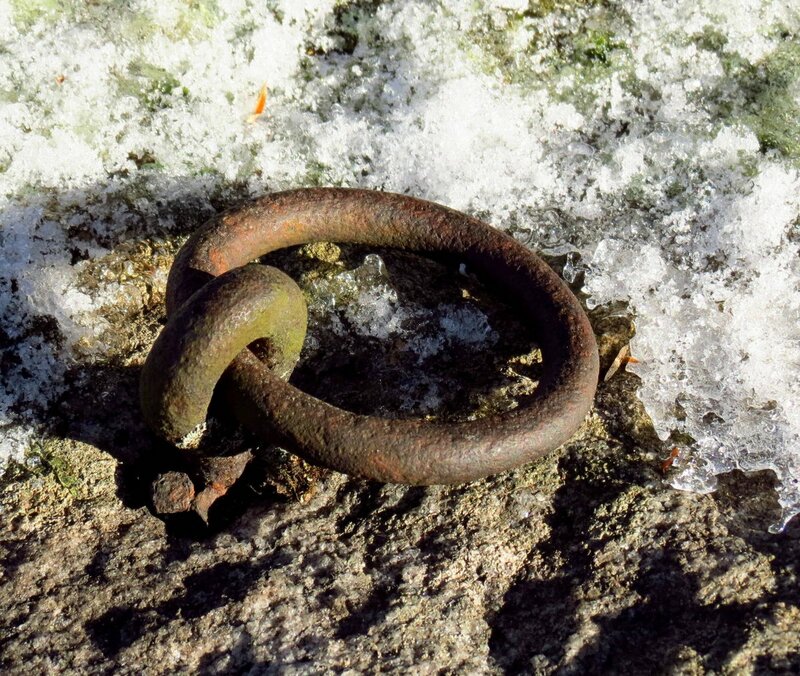 It’s another beautiful thing though, and eventually I’ll come across something similar in a book or on line that will get me started on the (sometimes long) trail to its identity. 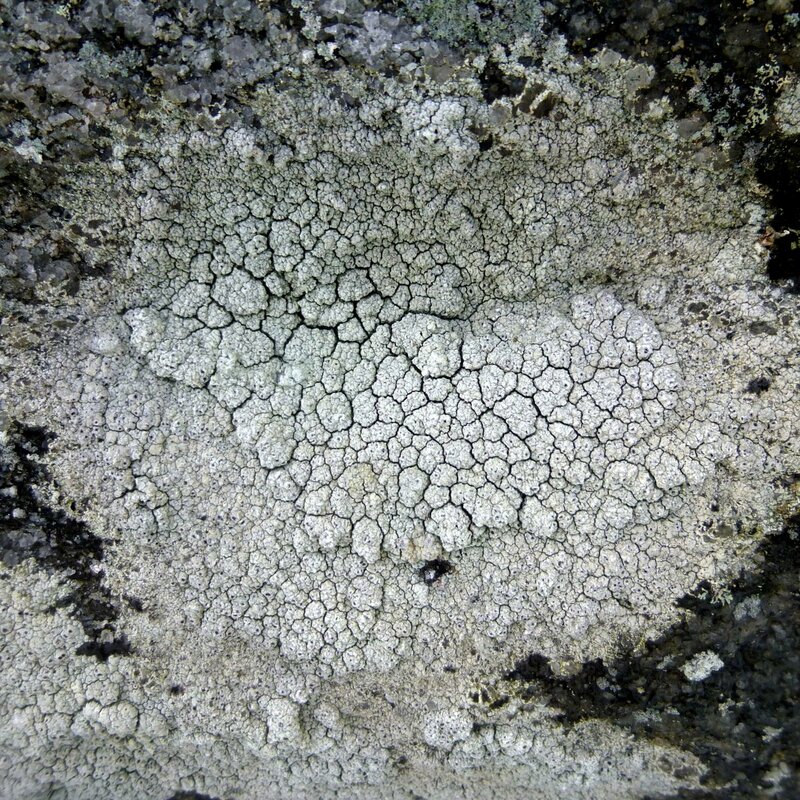 I should say for those new to this blog that I am strictly an amateur at lichen identification. I don’t have a microscope, chemicals, or any of the other tools that lichenologists use but neither do I guess at lichen identities. I use the tools that I do have and often spend many long hours trying to identify these little beauties. 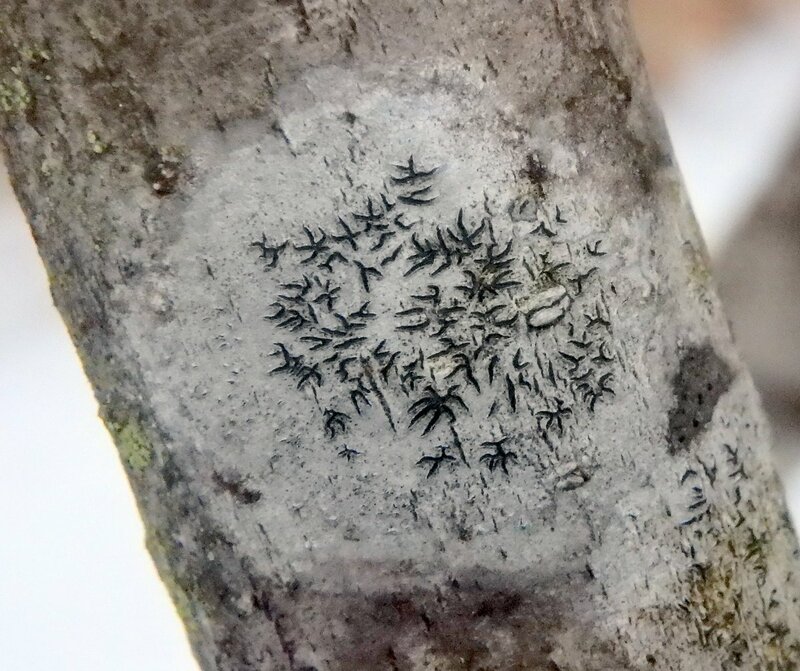 Though I’m fairly confident of a lichen’s identity before I put it into a post, you should be aware of my limitations and should not bet the farm on what I believe it is. If you happen to be reading this and know of any mistakes I’ve made I’d be happy to have you correct them. When that happens we all benefit.